Forty-seven days (October 2014 – January 2019) of serious planning and hard work to complete a challenging project. A stunning effort by the membership of Romsey Golf Club. 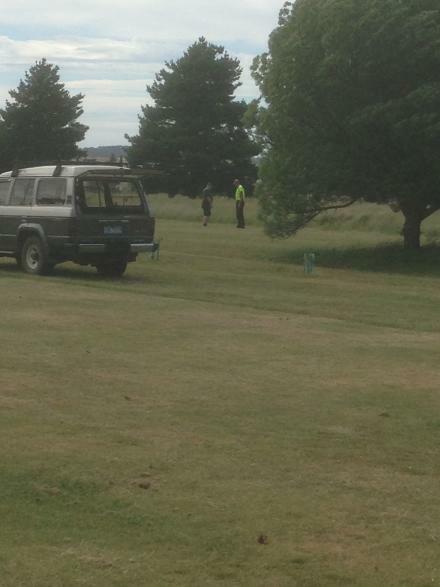 In August of 2014, after years of planning, application writing and making representations to a wide range of government and private bodies Romsey Golf Club (RGC) was informed that both Western Water (WW) and the Macedon Ranges Shire Council (MRSC) had agreed to allocate all remaining funds from the “Putting Locals First” (PLF) grant (the original grant that connected re-cycled water to the Romsey Sporting precinct) to us to assist with a serious expansion to the exisiting golf course irrigation system. The existing system irrigated the greens only and used potable water. Special thanks to Graham Treadwell, Rod Clough, Michelle Nolte and Katelyn Stevens from MRSC and Kate Berg from WW. 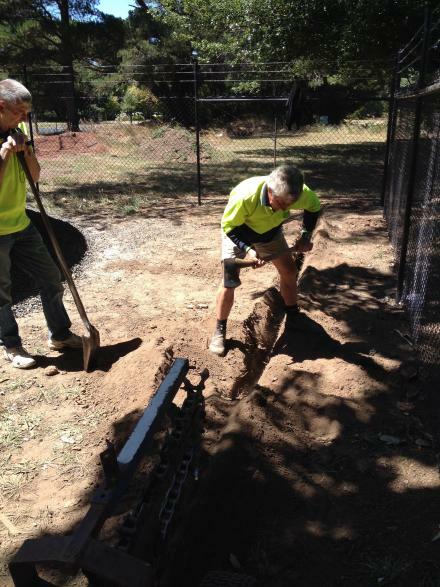 Their ideas, willingness to negotiate and guidance were of invaluable assistance and vital to RGC completing stage one of our re-cycled water project. 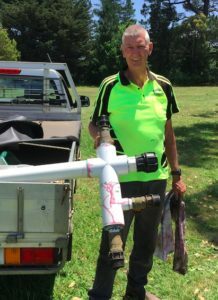 Thanks also to Mick Breen, Sunbury Water Life, he was always on the lookout for ways to make our money stretch that little further. His knowledge and experience were instrumental in shaping the final design of the whole project. These remaining PLF monies would allow us to access and utilise the 10 million litres of re-cycled water that the Macedon Ranges Shire/Western Water “Putting Locals First” grant application had allocated to RGC. To make sure that we were able to do as much as possible the club opened a special “Re-cycled Water” bank account; a number of members deposited funds and the club itself also allocated additional monies. We knew we had a big job ahead of us but with good planning and clear communication we could attack it task by task. 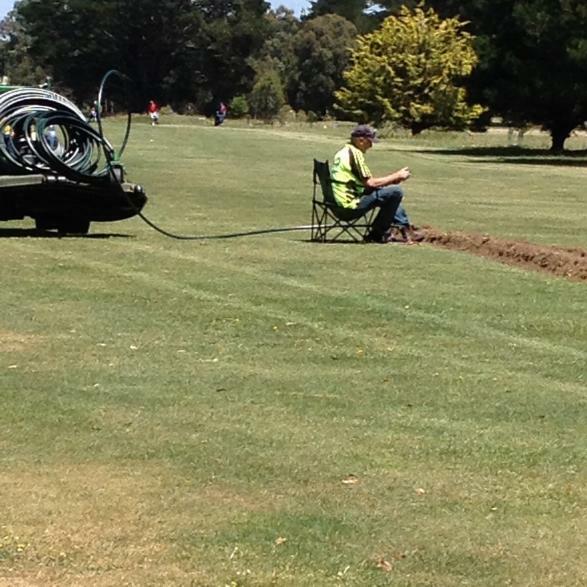 * how to best utilise the exisiting, greens only, irrigation infrastructure? 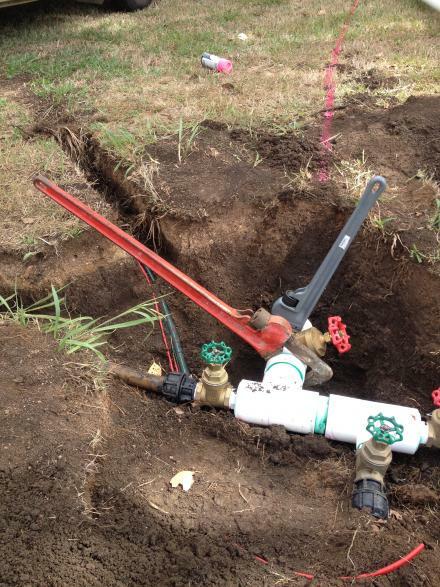 * how to get pipe, cable and decoders to all the necessary valve boxes? * could we locate additional funding? 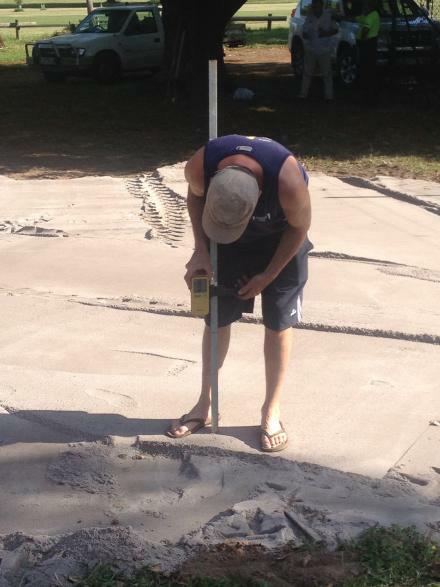 * mark-out and level the tank site. “I think I can get it to within eight to ten mm, will that be OK?” he asked. Sure was! With John Boyce along for support and guidance the site was soon levelled and crushed rock smoothed out as the final base. 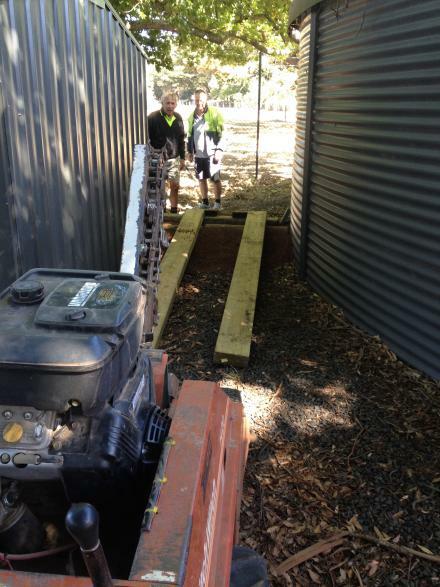 A few day later the boys from “Rhino Tanks” arrived and put up the tank. 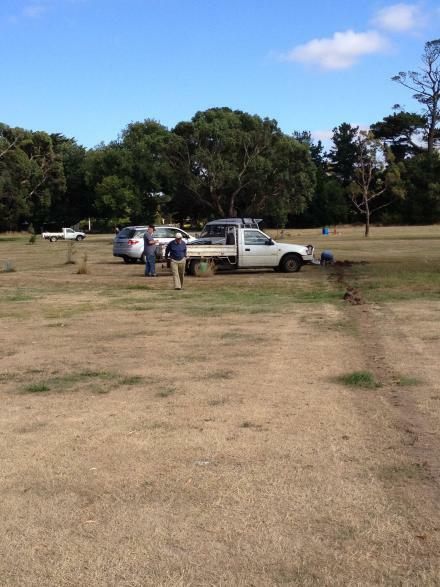 This was quickly followed by the gents from Kilmore Fencing who put up the security fence. Sorry no pics. Now, when this thing goes “Beep” we are on the money. A quiet drink in the shade after an excellent job. Ta Andrew. 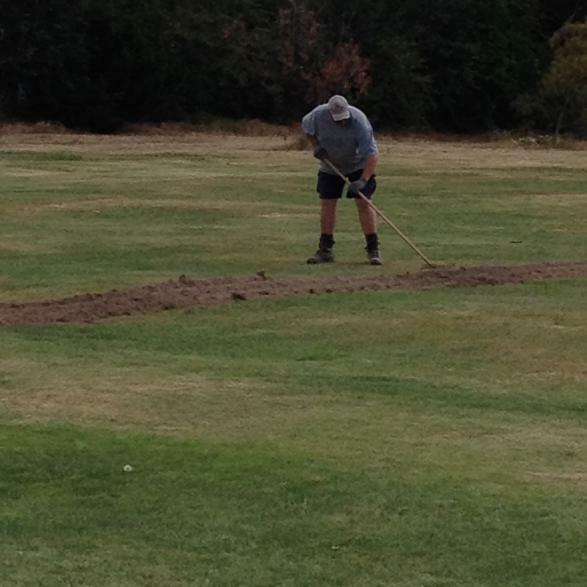 Andrew Clement picked up the trencher for us and gave us a quick tutorial and then dug the first couple of trenches. His memory for the exact location of the pipe running down the western side of the 6th was simply astounding. 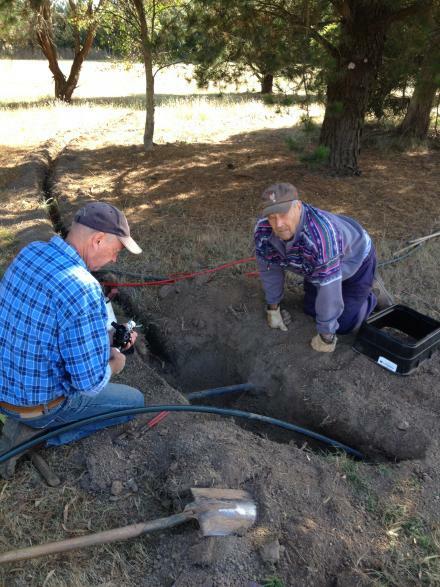 A few lessons and Andrew was prepared to hand the machine over to Tony L.
Ron Walker and Les Gaunt (Twig) were soon at work laying pipe in the trenches and connecting the sprinklers and the T-joins for the water inlet junctions. 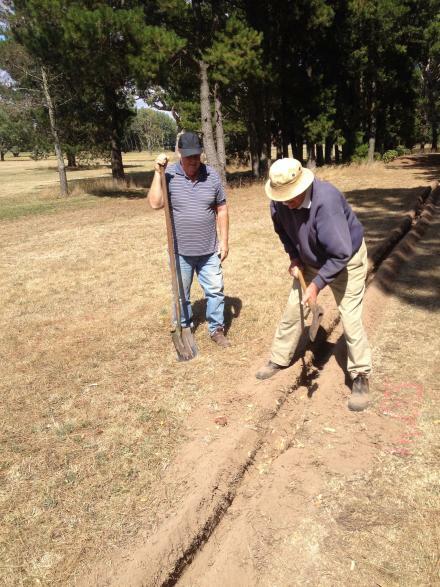 Dave Muller and Tony Freeman arrived after lunch and put in a good afternoon’s work levelling and packing the sprinklers with sand and back filling the trenches. All told we put two banks of sprinklers in the 6th, three banks in the 7th and one bank in each of the 15th and 16th. Many of these 56 metre trenches and their accompanying trenches to the edge of the fairway were backfilled. Ron, if you push this way, it goes forward, stop taking pics and get over here Tony, you’re going to have to drive this thing. Now, that’s what I call a good trench. 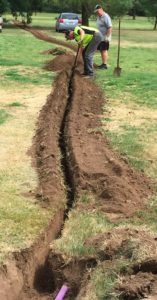 We trenched, laid pipe and connected sprinkers in the old 10th and the top of the 9th and ran two banks and side trenches into the 8th/17th. Every now and then we had to find the ring main and a deal of time was spent watching Twig and Ron using their seemingly magic bits of wire to find the existing pipe, worked pretty well too. Dave just loved the sound of the soil falling on the pipe did get a bit wearing after a few hours though. Ta Ron, this seat is a winner. Ron, Bob, Tony L, Bruce Robb, Beryl Cole, Lorraine Robb, Wendy Gosden and Kath Jekabsons were on the job. 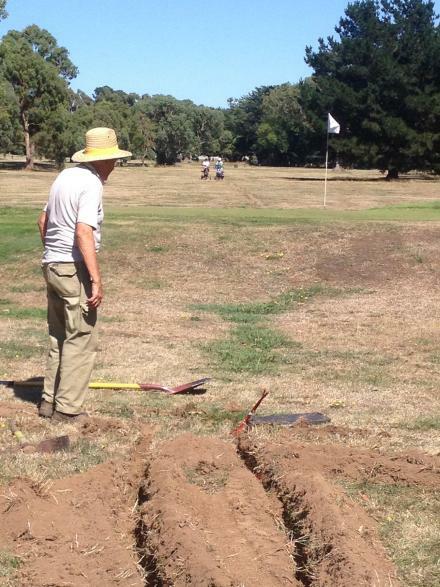 It took a while to sand the sprinklers and back fill and level the trenches on the old 10th and the 9th. 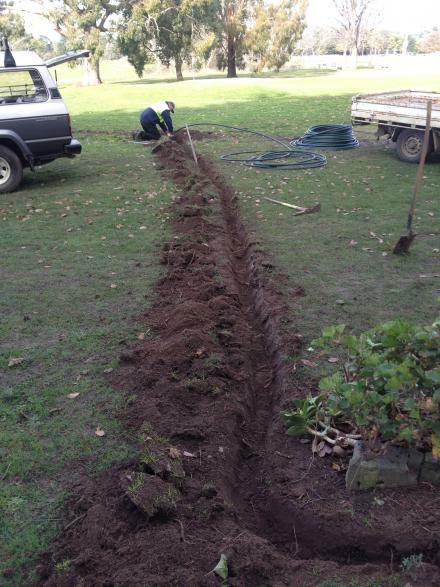 Perhaps the longest trenches we will do. The team then set about putting one bank into each of the 1st and 2nd. Again the “magic wire” and mattock came out when locating the pipe down the north side of the 2nd; the wire proved fairly reliable again. 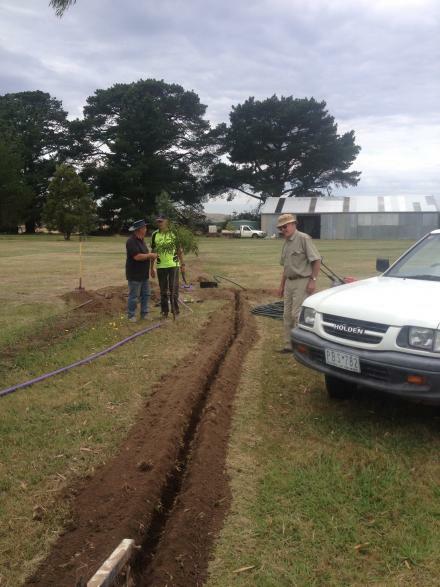 All sprinklers were levelled and sanded and all trenches backfilled. A good effort on quite a warm day. 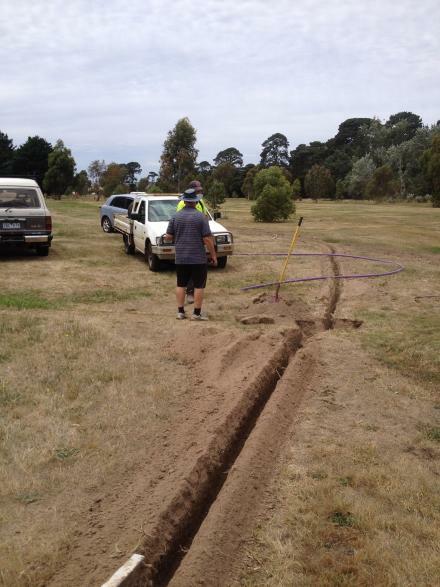 So, you reckon the pipe is between the white lines hey Bob? All sorts of weather was predicted and that is about what we got. Ron, Bob, Tony L and Andrew Laing were on the job. We began on the third. The first bank of sprinklers went in reasonably quickly then a spot of rain, a bit of thunder and some sun. 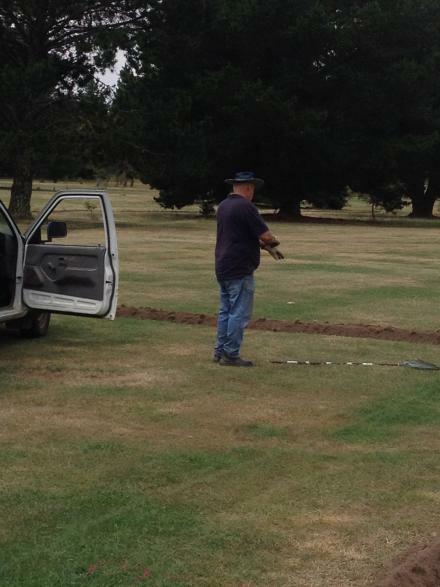 Sprinklers were connected, levelled and sanded and the blueline pipe behind the 2nd was located so we could trench the junction pipe. The 2nd bank was a different matter. The rain had continued and the ground became slippery, backfilling became much more demanding as the water infiltrated the loose soil. Then, just as we were finishing the junction trench the trencher stopped. Check this, clean that and Bob & Ron had her back up fairly soon. All the while we could hear Twig hard at it chewing his way through the rough which had grown quickly after the previous weekend’s rain. When the rain let up the trenches were back filled and by mid afternoon it was decided to call a halt and to hope for better conditions tomorrow. I’ll get the T Bob. 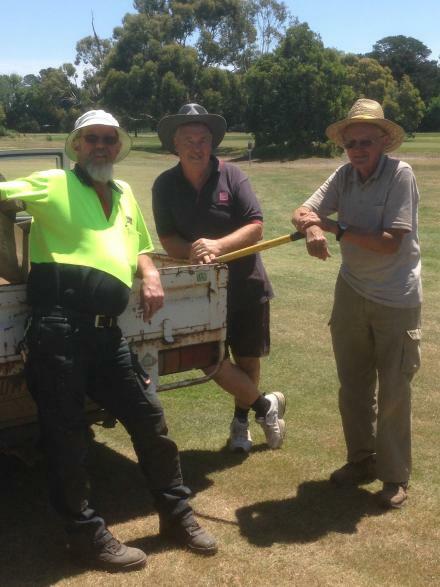 Ron, Tony L and Bob were again on the job and John L turned up just after lunch to give us a hand before he headed off to mow tees and surrounds. Twig was also out early and we could hear him cutting the rough across the course. The whole park/course is looking great, a credit to Twig’s hard work and his affection for both the club and the course. Had better refill that 44 again! Time to clean up the 2nd. A spot of divining was required to find the blue-line on the north of the 2nd. Again the wires put us pretty close so not too much mattock work was needed. 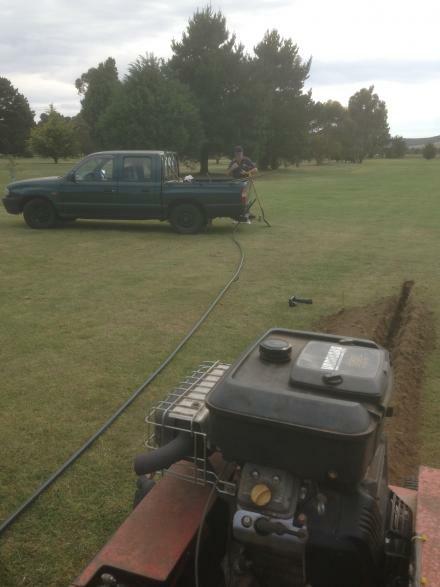 The 2nd bank of sprinklers went in quite smoothly, trencher happily chugging away and pipe rolling out. The next bank, which will cover the 10th and a small section of the 2nd was not quite so quick. Setting the sprinklers locations to provide as much cover as possible took a while then the odd “floater” came into play. A spot of work with the mattock and the crowbar and these rocks were out of the way. Mick Breen again turned up to explain another discovery he had made, this one should save us at least one roll of 40mm purple pipe. Ron, Bob, Tony F, Tony L, John L, Beryl, Lorraine, Kath & Bruce. were on the job. The crew were straight into it. A few extra hands made quick work of three banks of sprinklers and junction pipes. 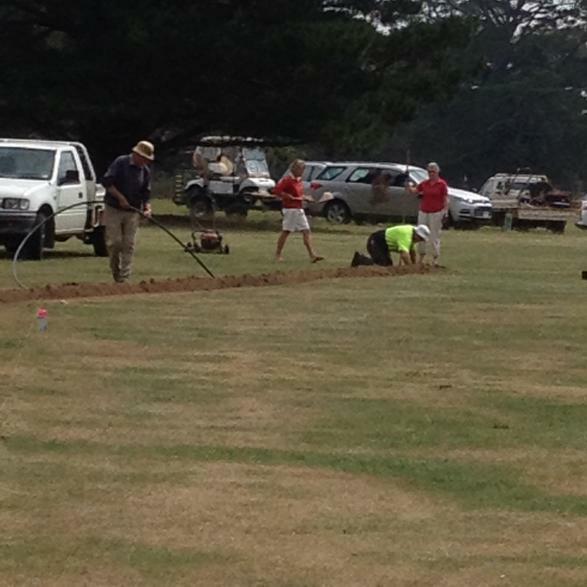 People were busy rolling out pipe, cutting in, sanding and levelling sprinklers then back filling the trenches. In about four hours we put two banks into the 4th fairway and one into the 5th fairway. We only need one bank each of 5th and on 9th/18th and two banks on the 18th to finish the fairway sprinklers. Next week we will be working Mon/Tue/Wed, starting work at 1.00pm and going through to around 5.00 – 5.30. Ron, Bob, Tony L, Mick Nicholls, Lorraine, Bruce & John L were on the job. Again those extra few hands made the work progress very quickly and by a little after 4.00 pm we had put the 2nd bank of sprinklers int the 5th and two banks into 18. We have to run a bank at the junction of the 9th/18th. Just three more banks to go and stage one of the fairways is completed. Ron, John L, Tony F, Tony L, Lorraine, Beryl and Bruce were on the job. Trenching the junction for the 2nd bank on the 18th and the 2nd bank on the 9th/18th proved a bit trickey but after much walking and looking at the plan all was well. We managed to put in two banks, the 9th/18th junction and a third on the bottom end of the 9th/18th. We now only have one more bank of fairway sprinklers to go, the 4th bank on the 7th. Tell you what Bruce, this reminds me of that pennant match against Sunshine in ’74, we got ourselves into a mess that day too! A quieter day, Ron an Tony L were on the job. Much mental gymnastics saw the north/south main line mapped out and the 10 valve boxes covering the 6th, 7th,15th and 16th worked out as well. 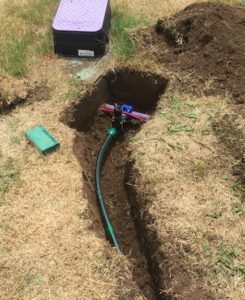 Oh, and we were able to trench, pipe, cut in, sand and level sprinklers and junction pipes for the 4th bank of sprinklers on the 7th. This makes 100 fairway sprinklers and associated piping now in the ground. A job well done, now to get on with the pumpshed, pump, decoder cable and 40 mm main lines. * One bank of four on the 16th. Ahh, the final fairway sprinklers are in place. Les, Ron, Lorraine, Tony L, Bob and John L were on the job. It took a while to sort out exact locations for the valve boxes and pipe for the 6th green and what will be neeeded for the men’s and women’s 7th tees. Along the way we discovered a few things. 1. Telescopic joiners are certainly not what they were cracked up to be. 2. 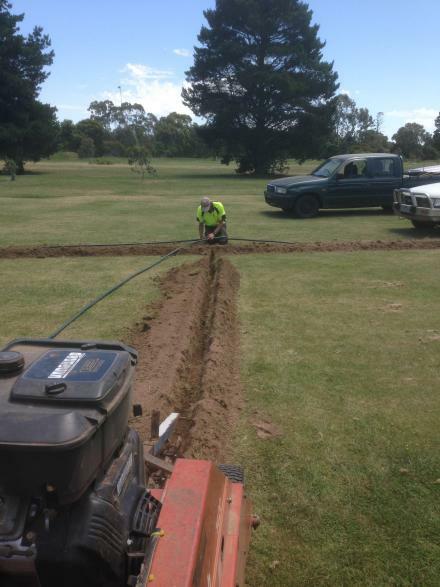 Supposed straight lines are not always straight, this may lead you to cutting buried pipe. 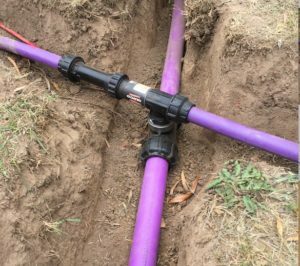 We joined the purple to the blue line in the rough on the west of the 6th fairway, ran lightweight red wire to the 6th green battery timer box and marked outwhere to run pipe to the 7th tee. All trenches were backfilled. A good afternoon’s work, especially with a few people having to duck off early. I tell you Ron, I know exactly where this telescopic joiner should go!! Les, Ron, Lorraine, Tony L, Beryl and John L were on the job. We began working our way up the north side of the 7th. The extra pipe and sprinklers for the tees will come off this pipe, it will be put in place as part of stage two of the project. John had the mower going overtime trimming the grass along the new trench lines. 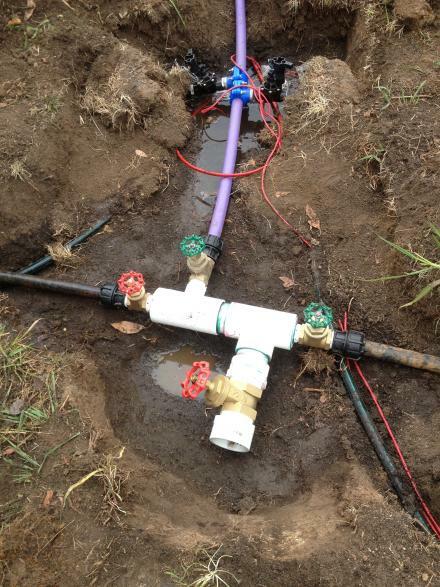 We ran the pipe and wire and connected the fairway sprinkler valves to the purple pipe to the lowest two sets of sprinklers. We also cut a gate valve in ready for the north/south mains line. Again all trenches were backfilled and levelled. Beryl, Lorraine and John showed just what a spot of hard work and determination can accomplish. 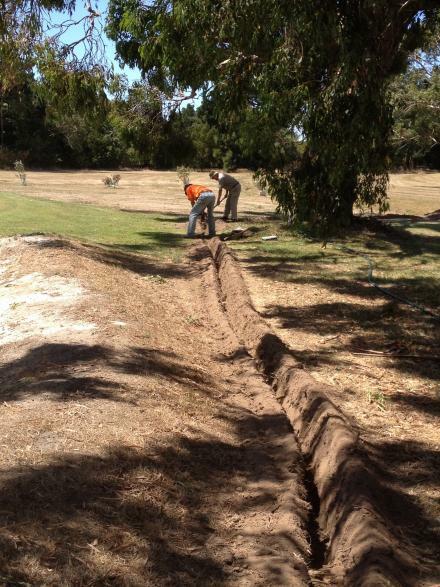 A trench was cut to the 7th’s top set of fairway sprinklers. Right, first the heavy red wire then the purple pipe, have we all got that? 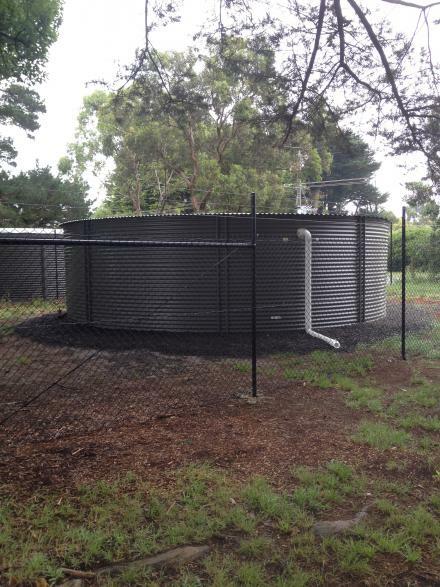 Our tank with its brand new security fence. 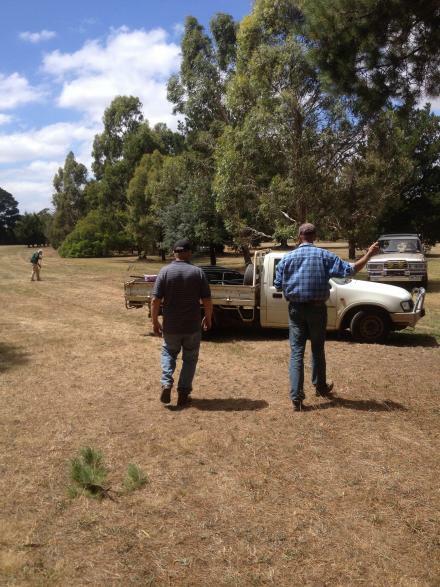 Ron, Tony L, Bob, John L, John Freestone, Bruce & Lorraine were on the job. 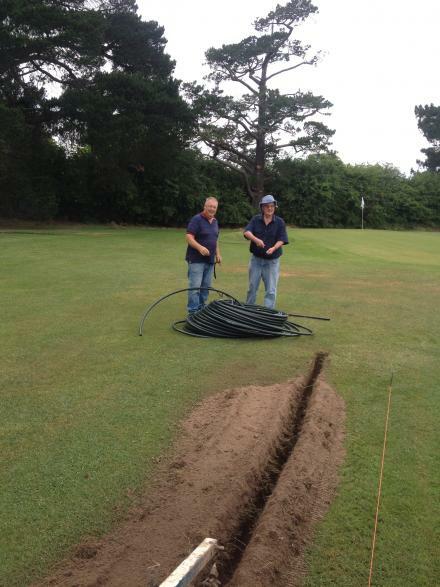 We worked our way up the 7th/14th connecting bays of sprinklers to the purple mains pipe and dug in a box for the tee sprinklers on the men’s 7th/14th and the womens’s 7th. Final works on these, and all other tees, will be finished once we are able to finance stage two of our re-cycled water project. 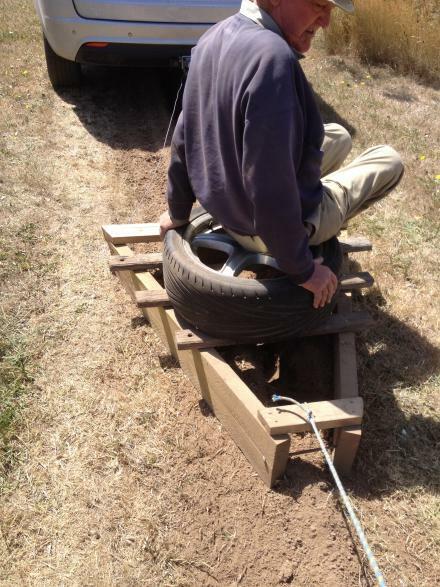 John L had even built a “toboggan” to assist us to back fill the trenches. Ron, John F and Bruce had a great time working with John to find out exactly how to get the best result from this labour saving machine. All had a good time and the “toboggin” ended up being very useful. We took the purple pipe all the way up to the ring main beside the 7th green. 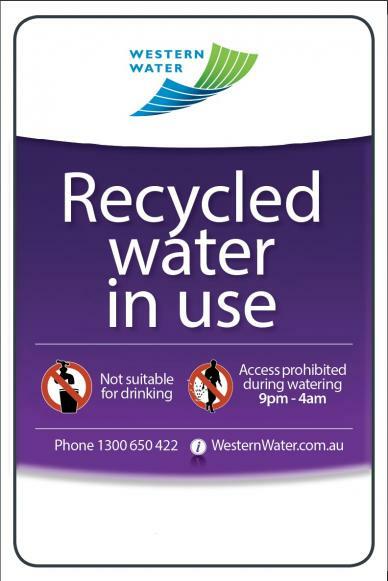 A call from Kate at Western Water saw us ordering ten “Re-cycled Water in Use” signs organised, to be picked up later this week. Hopefully we can put these signs up in the very near future. Will someone stop the car until I connect this valve box? Twig, Bob, Tony L, John L, Ron, Bruce, Beryl and Lorraine were on the job. 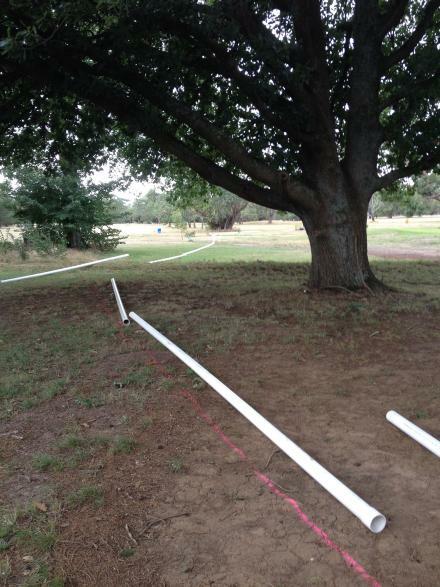 We began by joining the purple pipe from the 6th to the existing blueline in front of the 8th tee. 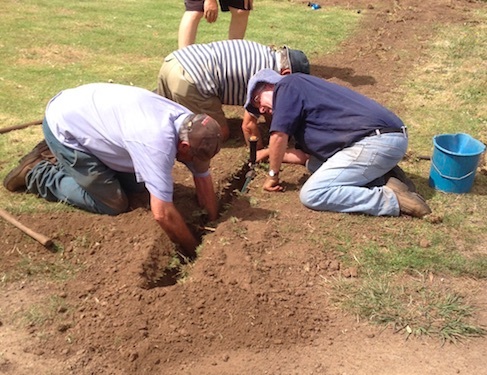 A fair bit of digging, and lining up to get all the joins completed. 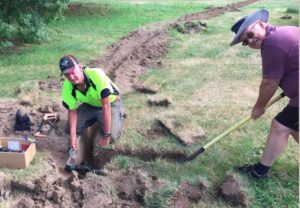 From there we trenched up the south side of the 16th to get decoder cable to the fairway sprinklers on both 15th and 16th and up to the 15th green. We worked out where/how to run pipe/sprinklers to the shared 8th & 15th and men’s and women’s 17th tees. Tees will be completed in stage two of this project, if and when funding becomes available. 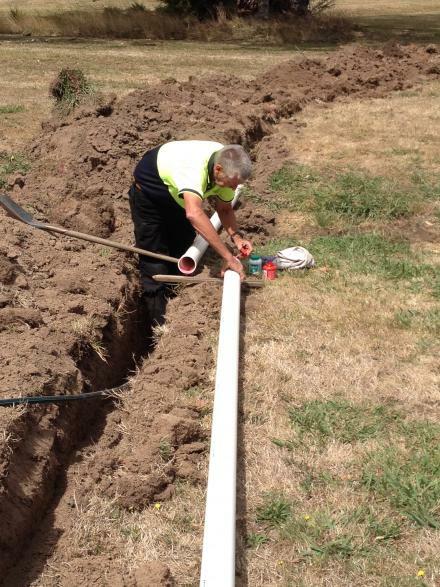 Valves and valve boxes were fitted and all trenches were backfilled. 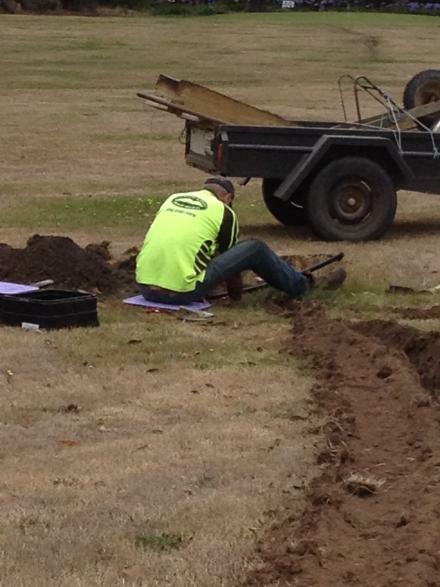 A spot more decoder cable and this section of the course will be finished. So, found the blueline ring main, no damage, just waiting for the water to be turned off before we connect the purple pipe. The master touch makes sure all is well. This junior golfer was checking out the works while mum kept a close eye on proceedings. Bob, Ron, John L, Tony L, Beryl, Mick, Bruce, Andrew L & Lorraine were on the job. Much trickey work was successfully undertaken. 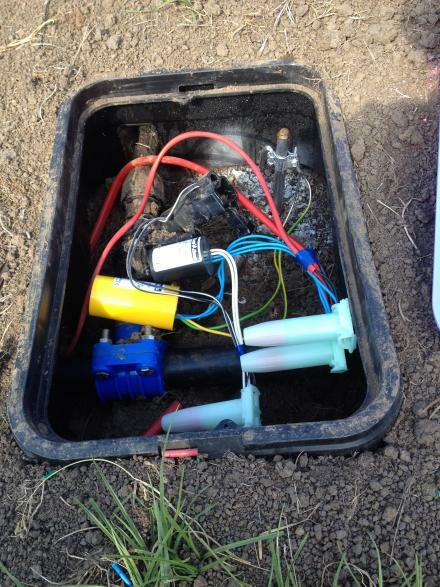 Heavy red decoder cable was laid and backfilled to the 15th green battery timer box and 15th fairway sprinklers. 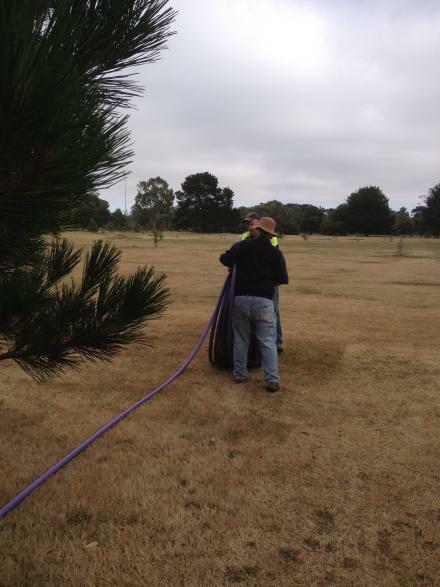 We spent some time working out how to get pipe/sprinklers to the 16th tee. That one will be fairly straight forward. 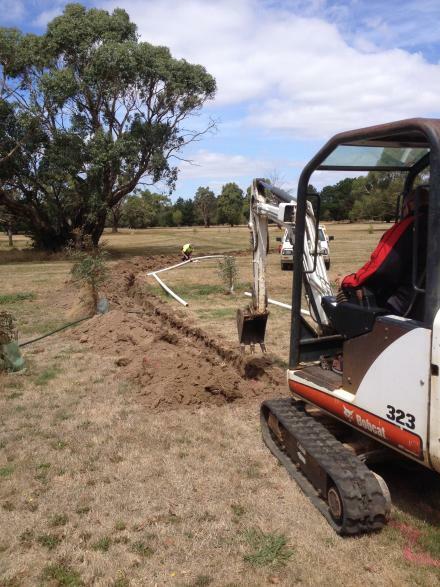 All tees will be trenched and connected to water as part of stage two of this project. Our new “Re-cycled Water in Use” signs. Andrew L, John L, Twig and Tony L were on the job. Trenching to connect the east/west line along the 7th to the ring main behind the women’s 10th tee were begun. Pipe was rolled out and the trencher fired up. All went well until the drive chain on the trencher broke. 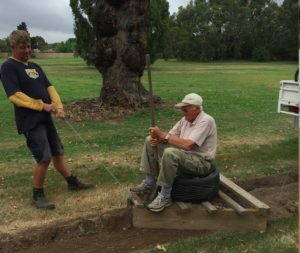 We did get to see John driving the ute towing the trench covering machine with Andrew providing a spot of weight and Twig steering, all he needed as a whip and a mule and he could have been ploughing a field in the ’30s. Rudi, Romsey Mechanical Services, was quite happy to come over and have a look. He later rolled up with the fork lift and took the “Brutus” to the workshop. There has got to be an easier way to roll out this pipe! 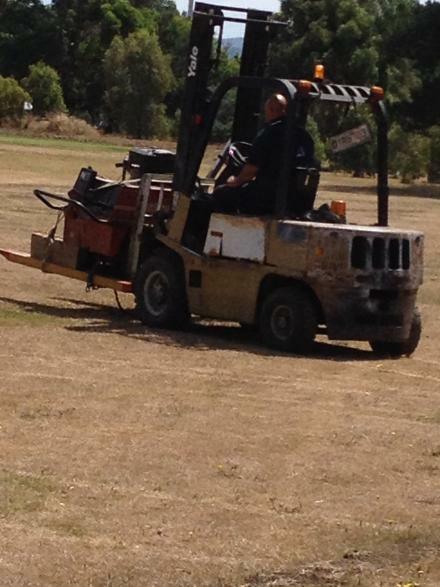 A spot of rope, a block of wood and you can do almost anything with a forklift. Twig, John L, Andrew L, Bruce, Lorraine and Tony L were on the job. 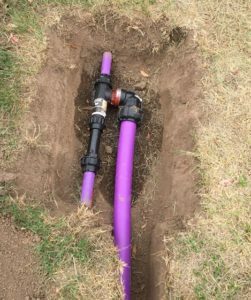 With purple pipe sticking up in the middle of the 18th fairway it was decided to continue the north – south run from the 7th fairway to behind the women’s 10th tee. The end of the run was in sight and all was going swimmingly when we smelt hot rubber, seconds later the belt that drives the digging chain disintergrated. 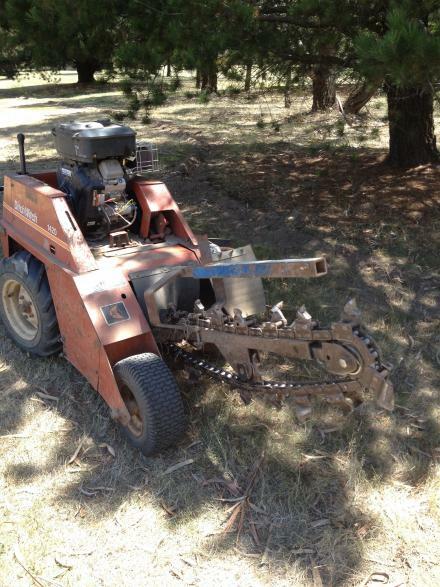 Tony L was quickly over to Tom O’Deas for a replacement but no luck there so a web search found DitchWitch in Campbellfield. A call, some revisiting the machine to check on details and some extra belts were ordered. The missing belt was replaced on Tuesday afternoon and all was ready to go for Wednesday. 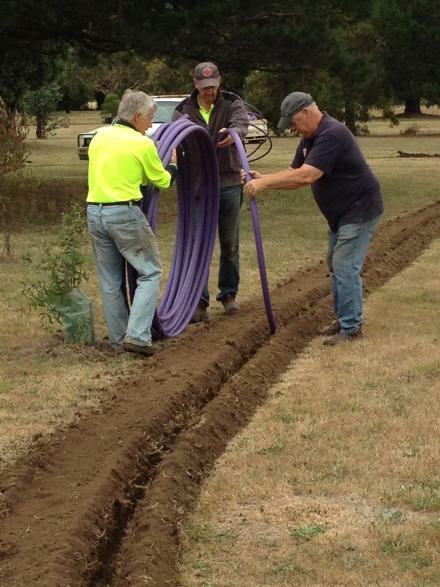 Some “Old Hands” have a go at unrolling the purple pipe. Just about got the trench backfiller under control. Tony F works to replace the damaged drive belt. Bob, Bruce, Twig and Tony L were on the job. The north-south line was completed and connected, with gate valve, to the blueline ring main. From there we headed back to the east-west line along the 7th. 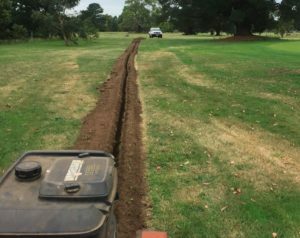 We trenched, laid pipe and red cable, connected fairway spriklers down the 8th, connected the 1st bank of fairway sprinklers on the 6th. A couple of “Old Stagers” getting on with the job. Bob, Ron, Tony L and Twig were on the job. We planned to run a pipe and cable from the north-south main up through the 9th fairway and passed the 9th and 18th greens to connect to the blueline ring main. 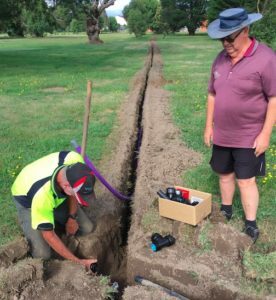 Along the way we connected four banks of fairway sprinklers on both 9th and 18th and also trenched to the existing battery timer boxes that control irrigation on the 9th and 18th greens. Only slipped the digging chain off once but our experience from Monday soon saw everything re-connected and working again. At last a system, Twig, you push, Bob, you pull and I’ll feed it in. 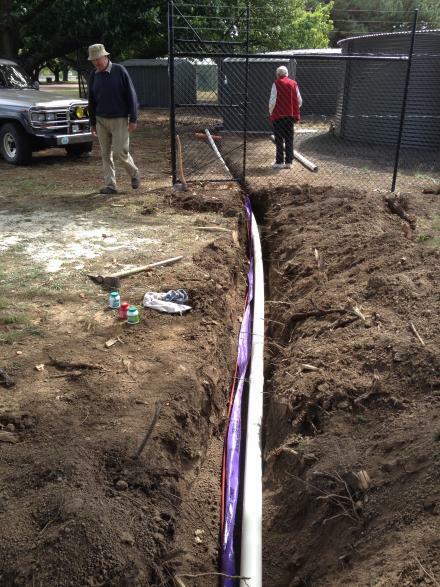 We flushed the purple pipe before connecting to the ring main. A big day with plenty to do. Twig, Bob, Mick, Ron, Tony L, Andrew L, John L, Bruce and Lorraine were on deck. A deal of time was spent designing the best way to get water to the women’s 9th tee, the shared 18th tee the men’s 9th tee and the women’s 6th tee. 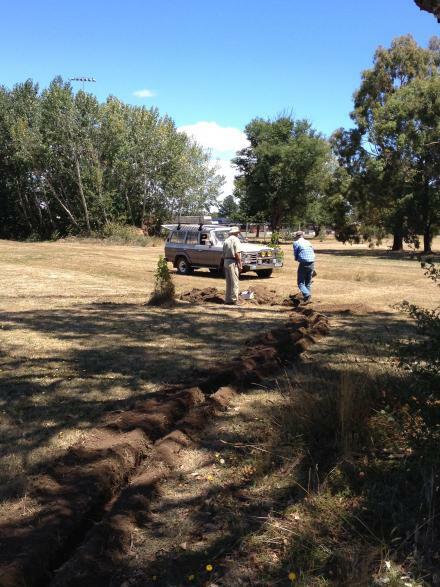 These tees will be trenched and connected to water when we move into stage two of the project. 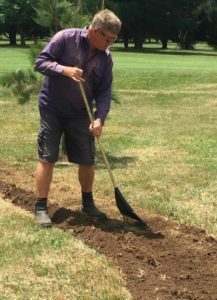 We also walked, measures discused etc the best way to get heavy cable to pick up the sprinklers on the 2nd and 3rd fairways, the women’s 3rd tee and 4th tee and the men’s 3rd, 4th and 6th tees. All in all, much accomplished. 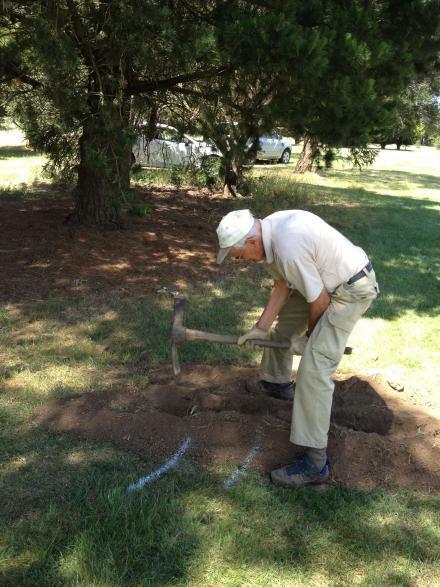 Well gentlemen, it seems we have found the old blueline ring main behind the 5th green. Now Ron, this one goes to the 5th green and that one to the 1st set of fairway sprinklers, right? 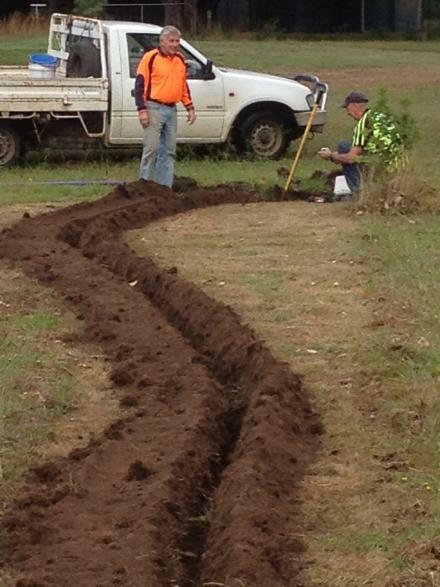 Only the truly experienced can produce such a very neat job when backfilling a trench. On the way we picked up two banks of fairway sprinklers and the 4th green battery timer box. A faulty join on the north-south line was also repaired. A gain a deal of time was spent designing how to get water to the men’s 5th tee, shared 12th tee and the women’s 5th tee, in the end a can of line marker. To be completed as part of stage two. Once all was connected we had a look at the fairway sprinklers. The certainly looked good even with the strong northerly wind. Certainly great to see the works so far have been sucessful so far. OK everyone, this is our last roll so let’s get it right. Yes, after all that work the fairway sprinklers work. Ron, Twig, Tony L & Bruce were on the job. 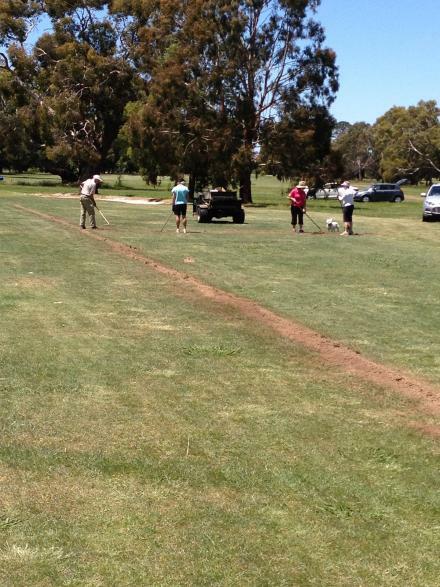 As we trenched, laid pipe, dug in valve boxes etc the ladies worked their way around the course with vague promises of coming back after their round to help backfill. We trenched from the battery timer box on the 5th green across to the 2nd green and then down to the battery timer on the 3rd green. Heavy decoder cable and light red cable was laid. We then trenched across to the blueline ring main to pick up the 1st set of fairway sprinklers on the 3rd, from there we followed this blueline further up the north side of the 2nd to pick up both sets of fairway sprinklers on the 2nd and the 2nd set on the 3rd fairway. Yes, now we now where the old blueline runs. John L, Lorraine, Twig, Bob, Tony L, Mick and Ron were on the job. There was some back-filling from last Wednesday to tidy up then we began finishing off the fairway sprinklers on the 2nd and 3rd fairways. There was much discussion re planning for the men’s and women’s 3rd tees. It was decided that, when stage two gets going, these tees would both come off the one decoder operated timer. 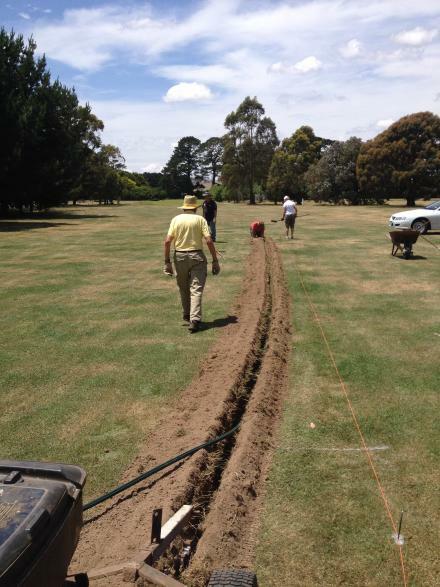 We walked the 1st fairway to sort out where to connect from the pump to the blueline ring main. The huge trees around the tank will certainly mean serious root problems. 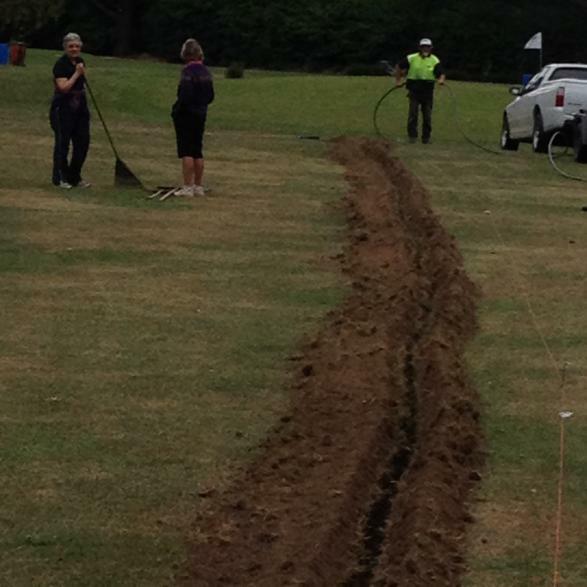 We also had to trace the blueline up the south side of the 1st fairway, no more hitting that pipe. Just as we were leaving we came across a couple of battery timer operated valves that had become jammed open, carefully unscrewing the tops showed pieces of plastic from out saddle joins. No doubt we will have a few more of these before all the detritus in the lines clear. So, all that’s left is one on the 10th and one of the 1st? Twig, Tony L, Bruce, John L and Ron were on the job. 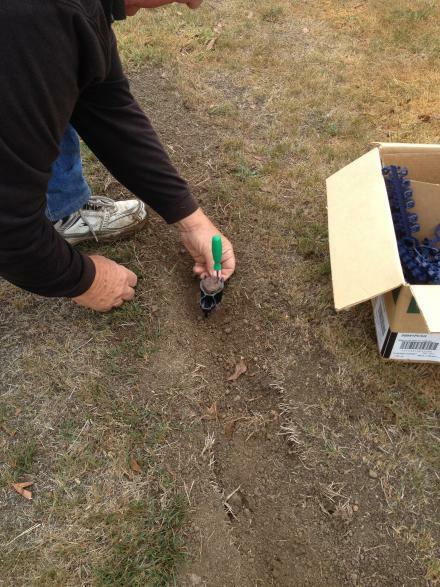 We set about placing the purple valve boxes over all the uncovered valves across the course. 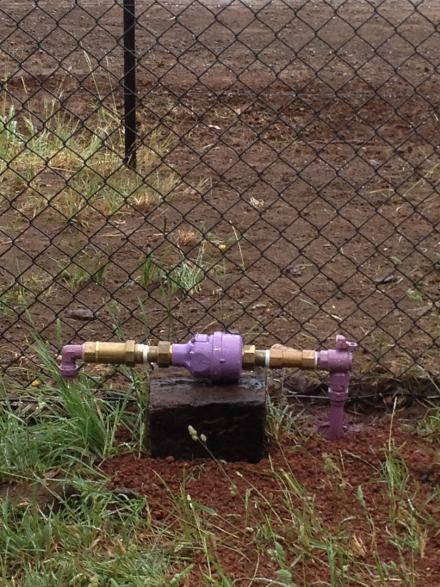 We also placed a number of smaller boxes over gate valves and pipe or decoder cable joins. There was much discussion re how best to get the 80 mm pipe from the pump to the ringmain. 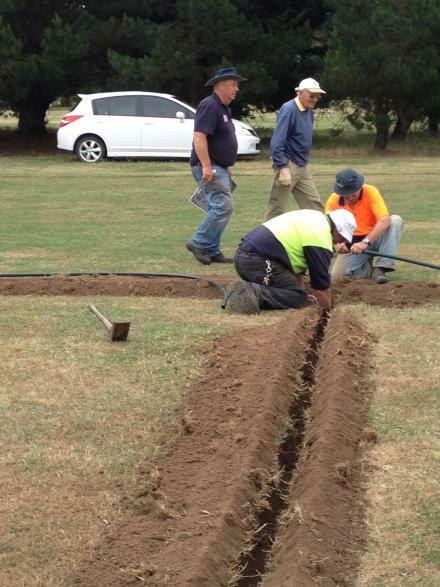 In the end we decided to call in the expert, Mick Breen (Sunbury Irrigation) to point us in the right direction. Some trenching was done and Brutus slipped the digging chain drive chain. After some investigation we located the problem and soon had it fixed. After a briefing session the crew heads off to work. 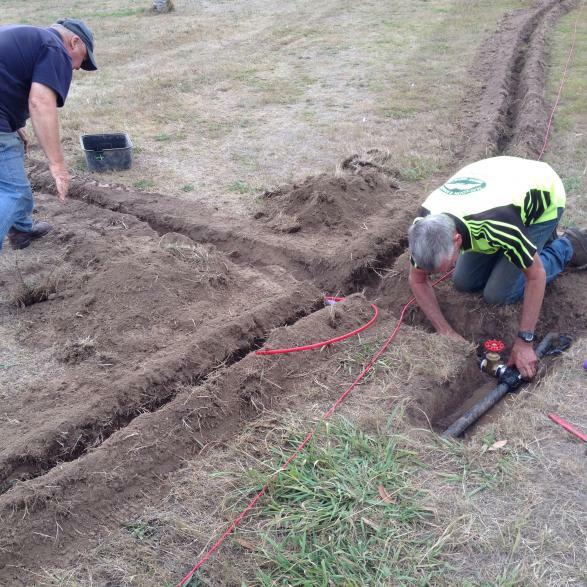 John’s design, the quickest way to backfill any trench. John L, Mick, Twig, Tony L and Bob were on the job. After much thought and discussion we sorted out exactly where the 80 mm pipe from the pump was to meet the 40 mm ring main. 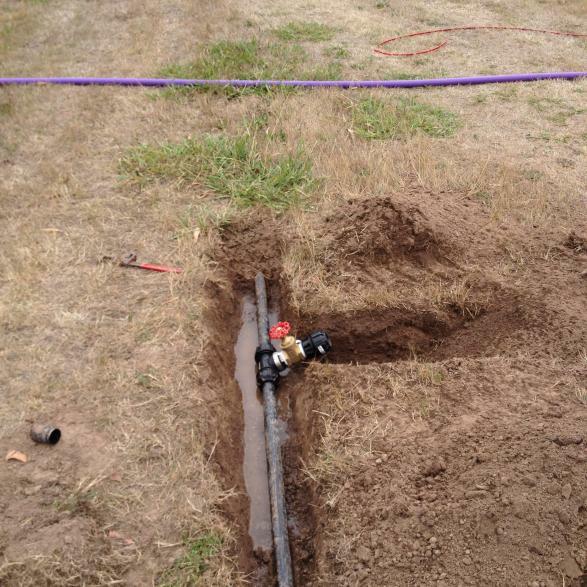 We had to attach a couple of valve boxes and run pipe up to the 1st fairway sprinklers. Light cable had to be run the the exisiting battery operated valve box on the 1st green. 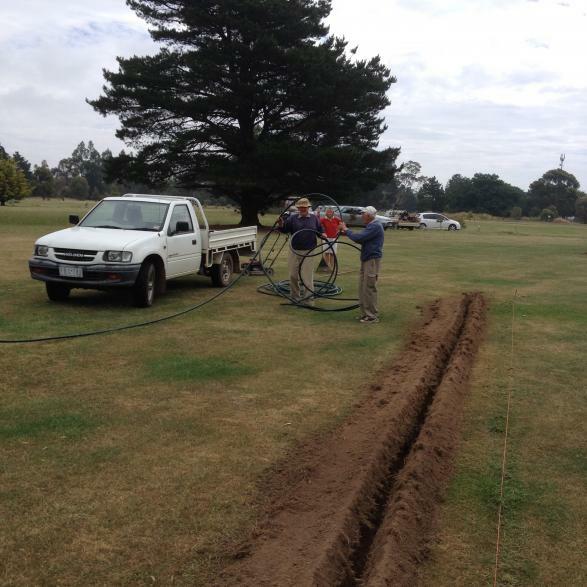 There was also much discussion as to how we were to get water to the 1st, 2nd and men’s and women’s 10th tees. Again these works will be done as part of stage 2 of our project. What do you think John, bring the 80 mm in through here? 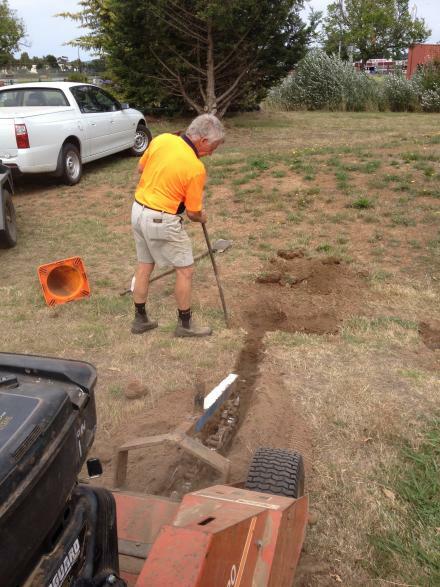 Yes Mick, this is definitely the last trench to backfill, that is until stage two. It’s going to get crowded once we join up the 80 mm but we’ve got it under control. Twig, Tony L, Bob and Ron were on the job. 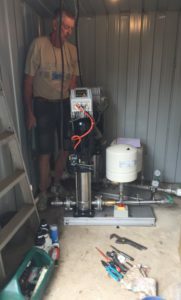 The day began with a visit from Mick Breen (Sunbury Irrigation) who walked us through the orientation of the shed and pump and how to connect the 80 mm pipe to the 40 mm ring main. We also had a visit from a representative from Rain Bird who talked us through how to join the heavy decoder cable and the light red cable. Twig took it all in, we will just do what he says and there should be no problems. 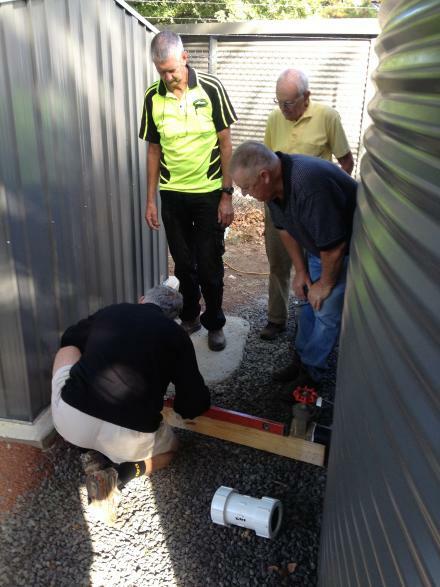 Stage two will see a central Rain Bird controller put in place in the pump shed. 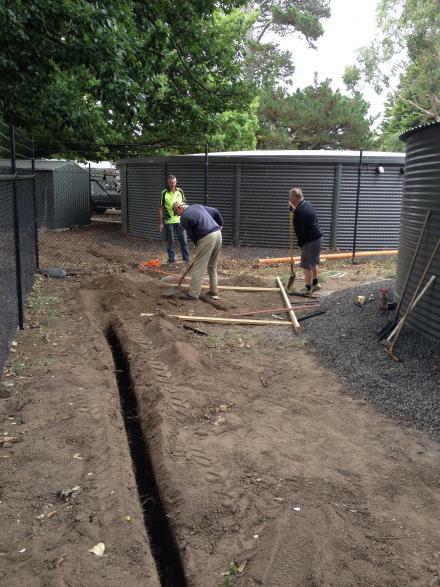 From there it was into the ovals’ tank enclosure to sort out how we would get Brutus unside to dig the trench and where we would run our power line. We decided on heavy sleepers and Brutus’ own ramps and numerous barrow loads of scoria to get him up and over the existing pipework. A spot of adjustment here and there and he was over. Ron then had to head home to take care of a European Wasp problem. This trench saw the digging chain come off once (not a problem we are getting good at this one) and the drive chain also clag up (again, we are getting good at this one too). A few roots here and there but excellent axe work from all three of us and the trench was completed. Brutus’ bridge over the water-pipe to trench the power in. Well Bob, I think we cut the power in here and begin the trench near your right boot. Ron, Twig, Tony L, John L & Bruce were on the job. Twig got to work connecting the power and feeding the cables through conduit before laying it. The rest of us got busy backfilling the trench, Twig carefully placed the required warning tape. 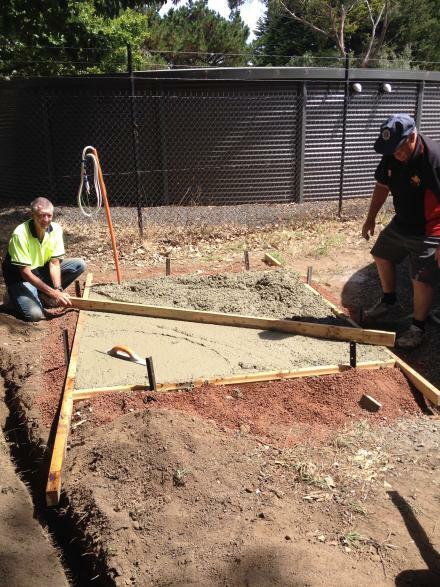 The shed slab was measured, framed up and levelled. Reo was purchased and concrete ordered. Of course Bob had also been busy dropping off stakes and trowels in preparation for the slab works. On Wednseday the tank was connected to the re-cycled water meter so we really are getting towards the business end of this whole process. Twig brings the power feed into our tank enclosure. The shed base, framed up with power supply almost ready to be made live. The day began with a meeting in the clubrooms, Graham Treadwell and Katelyn Stevens (MRSC) met with Ron, Twig and Tony L to discuss power meter location and associated bits and pieces. It was a good meeting with both sides happy with the morning’s discussions. Bruce and Lorraine joined us to put down the concrete. 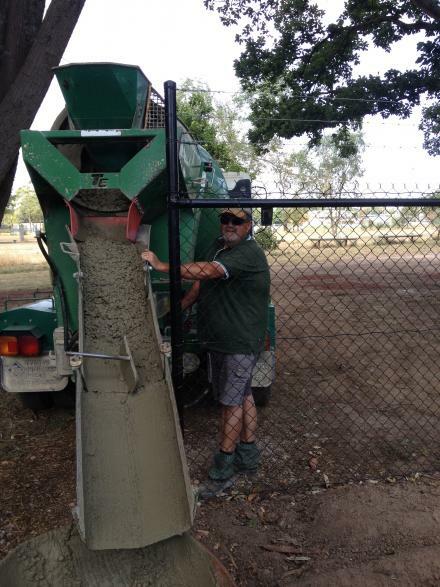 Just on midday Trevor, from Gisborne Garden Supplies, drove the mini-mix down to the tank. He could tell how much to put in the barrow by just looking at the barrow pusher! About eight barrow loads later and he was washing down the shutes and heading for home. 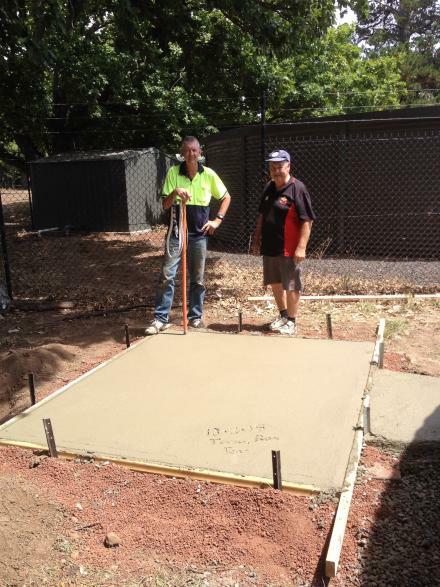 Ron, Twig and Tony L screeded and trowelled the slab and even used a spot of excess concrete to make a step in front of the door. Whilst Bob was not present he was well represented by various stakes and two trowels he had dropped off earlier. All in all a good day’s work. Trevor had a good eye for an exactly filled barrow. 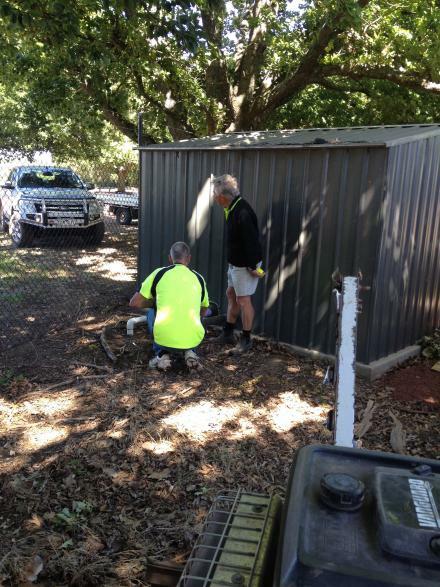 Job done boys, hey, look away for a second and someone scribbles in the concrete. John L, Ron, Tony L & Twig were on the job. First off arrange and assemble the main connection bringing water from the 80 mm pipe to the 40 mm ring main. A spot of priming and glueing then some careful, accurate cutting to make sure everything fitted and was water tight. Then onto the fairway sprinklers. The first 40 sprinklers we put in did not have the nozzle inserted. This nozzle dictates how much water is allowed through the sprinkler. A spot of kneeling twisting, lifting, inserting and then tightening and we were well on the way to fixing all 40 sprinklers. Ron took most of this work. 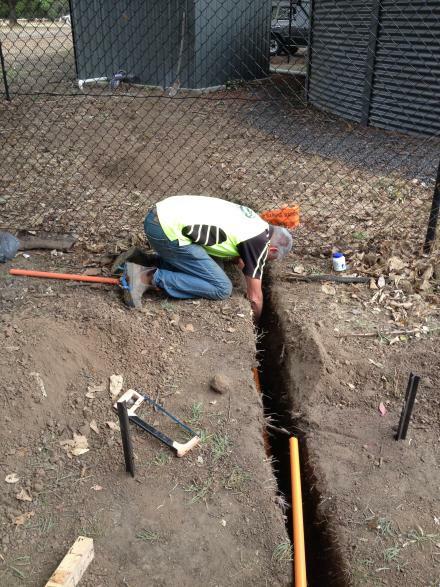 Next we had to walk the system to work out just where to place the 120 cm copper earth-rods. In all we will have 12 around the course and three in the shed protecting the pump. During our perambulations we came across one joiner that was leaking, a spot of work with the stilsons and all was well again. The old fittings were taken out and the pipes drained ready for the new 80mm to 40mm fitting to be installed. Our new fitting in place and under pressure, so far, so good. Simply insert the screwdriver, turn and lift then insert the No 4 nozzle, and tighten the holding screw. After a few sprinklers Ron had it under control, pretty bored by sprinkler 100! Ron, Bob, John L,Twig, Bruce and Tony F were on the job. Ron began on the fairway sprinklers. Each had to be checked to make sure it was on the correct angle and then to make sure that it was spraying the full 360 Deg. Twig set about installing the earth rods, and joining and sealing all the wires. 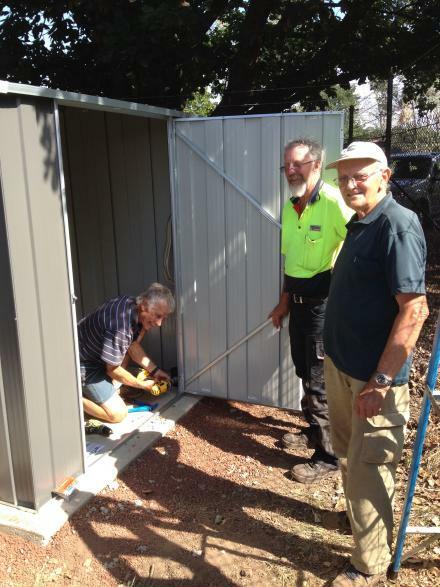 Bob, John L, Bruce and Tony F lugged the shed up to the tank and set about putting it together and bolting it down to the slab. All in all a good two day’s work, shed looks great and once you open one of the purple boxes you get to see just how much work Twig has done and also his attention to detail. These boys were so chuffed with their work that they were talking about entering the shed building game. From the left, actual worker (Bob), hired muscle (Tony F) and supervisor (Bruce). Ron, Tony L and Twig were on the job. Another warm day so Twig began at 7.30 am, Ron, working on the principle that the sprinklers would keep him cool, turned up a bit later. Tony L was busy dragging away the branches that had fallen over the last few weeks. Ron finished off the final banks of fairway sprinklers. Easily kept his cool. Twig finished off the final dozen or so purple boxes then had a good look at the shed to work out exactly where to site the switchboard, meter, switches etc. Twig, Ron, Tony L and John L were on the job. John F and Bruce dropped in to help out as well. 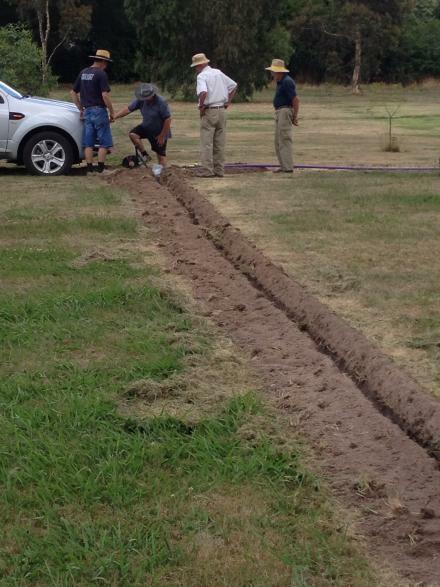 First thing, mark out a line for the new trench . We had a small leak from the 75 mm gate valve so a quick search produced two sets of stilsons, one borrowed and one bought. Some “Stag” applied to both surfaces and all was well. Ron and Tony L got into some of the larger roots close to the fence, a spot of axe work and all was well. 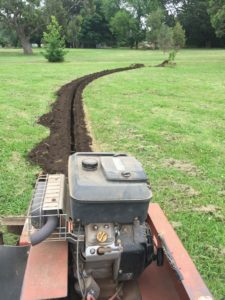 Brett Lockens “Locko” turned up with his excavator and put on a clinic in the clean digging of a gracefully curved trench. Next item the priming and glueing of each length of 80 mm pipe. A little trickey when the wind blew up but not really too difficult. 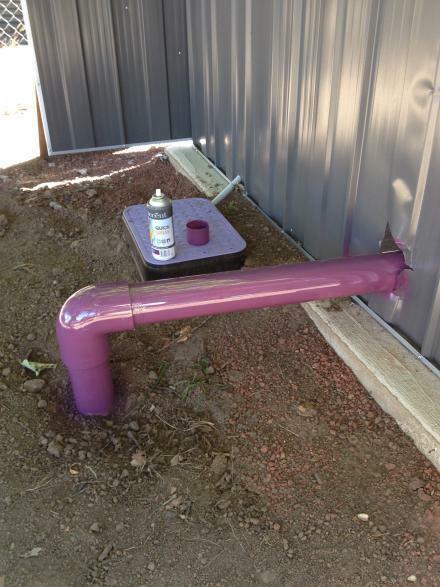 Apply primer to both surfaces, glue on both surfaces, insert, push pipe home and hold for a count of 20. Trenching and priming/glueing just about kept pace with each other. “Something borrowed something new” soon saw the gate valve undone, resealed and tightened. Twig begins priming & glueing while Locko keeps trenching. Pink primer on now for the green glue. John and Bruce check out the final length of pipe. 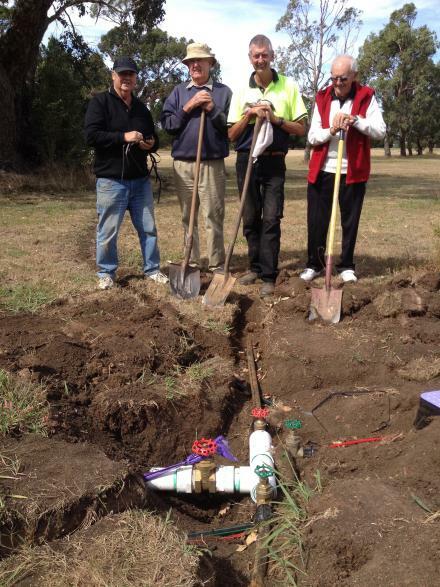 Ron, John L, Twig & Bruce, just after 80 mm supply is connected to the on course piping. Job well done gentlemen. Bob, Twig, Tony L, John L, Tony F, Ron & Bruce were on the job. First, unpack the pump and haul it into the shed then line up the pump inlet and the tank outlet and cut a hole through the north wall of the shed. Second, line up the pump outlet and the pipe out into the course and cut a hole through the south wall of the shed. Third, cut lengths of 80 mm pipe to fit then prime and glue. Fourth, bolt the pump to the slab. Fifth, plug pump in and turn on. All went well until we turned on the pump, the 125 psi was a little too much and the final elbow began to leak, pump quickly turned off. Nothing serious just a minor setback. Need a new connection to the pump and a new 80 mm elbow. After a quick call to Kate (WW) we now have the “Site Management Plan” and the “Drinking Water Disconnection” paperwork to attend to. Bob makes sure all is level before connecting the tank to the pump. 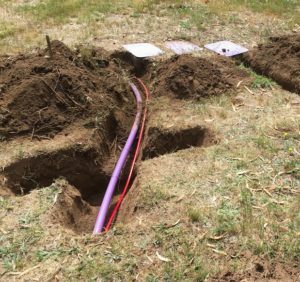 RGC has written to the Macedon Ranges Shire Council outlining our plans for stage two and providing a budget for material and related works (including the central controller and the decoders that tell the valves when to open and when to close so that irrigation occurs both at the correct times and for the correct period of time). We have asked that MRSC consider our applicaion when they are drawing up the 2015/16 budget. In the meantime, once we have disconnected from mains water and turned the re-cycled water on, we will be relying on our current battery operated timers to turn water on and off on the greens and a few banks of the new fairway sprinklers. So after 36 days of steady work we are just about ready to turn a somewhat abbreviated system on. The big day, disconnection from drinking water and the turning on of the re-cycled water. Kate and Trevor (WW) arrived and we went through the “Site Management Plan ” and the “Disconnection from Drinking Water” paperwork. 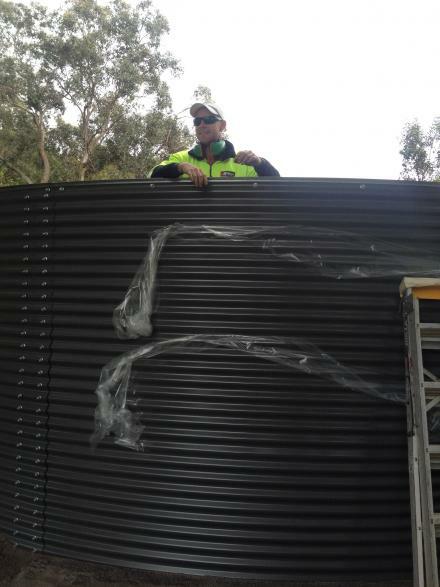 Then an inspection of the exisiting blueline main from the water meter. This line was cut and closed off so that re-cycled water can not mix with mains drinking water. So, now disconnected from the mains, we opened up the valves on the tank and ran the pump. The existing battery timers worked well and all greens were irrigated. Work on a few “spare” battery timers saw some of the banks of fairway sprinklers also working. We will investigate the viability of moving these fairway battery timers around so that more of the fairways get a drink. A spot of purple paint and all is good. 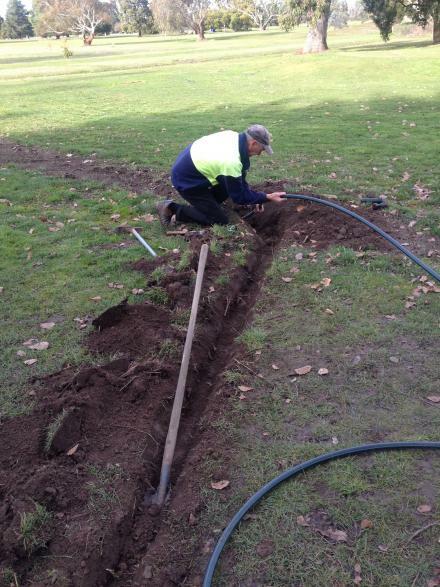 The pipe to the mains is cut and sealed before being reburied. 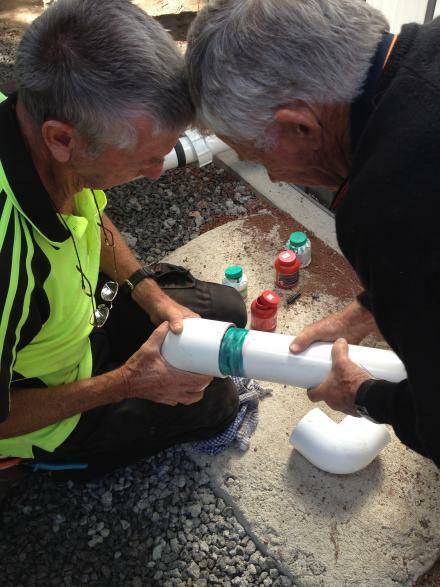 Greame Walker, local plumber, and Tony L were on the job. 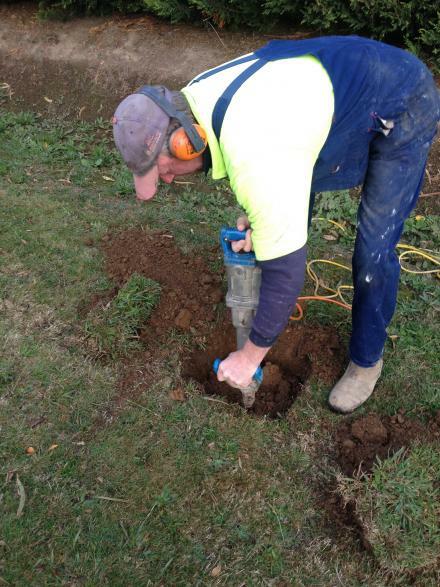 The negotiations with Western Water now saw us locating the connection to the mains and then digging down about 600mm to disconnect it. A great morning for work, freezing southerly wind, hail and then drizzle. To cap it off the pipe was 32mm not 40mm as we had been advised so off to the suppliers to pick up the 32mm cap. 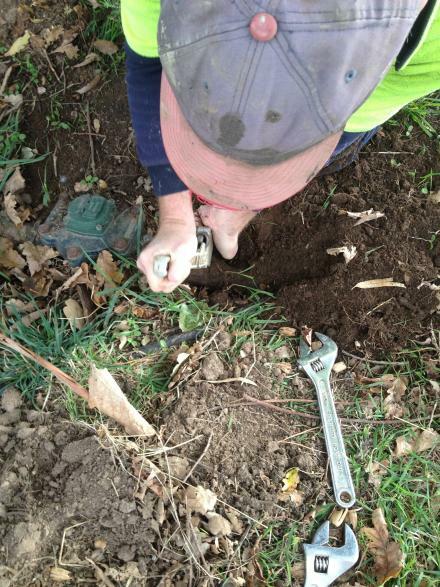 Once the pipe was capped off we disconnected the meter ready for return to Western Water. Graeme brought his version of the crow-bar. Certainly made things easier and quicker. Now, let’s get this meter back to Western Water. $10,000 funding for stage two was included in the 2015/16 MRSC budget. Unfortunately it is now too wet and too cold for our somewhat “experienced” workforce to re-start works until spring. We would like to thank the our MRSC councillors, especially Ian Ellis, Henry McLaughlin and Mayor Jennifer Anderson for their support and trust in us to spend these monies well. 2. A central control unit put in place in the shed to operate the decoders. 3. 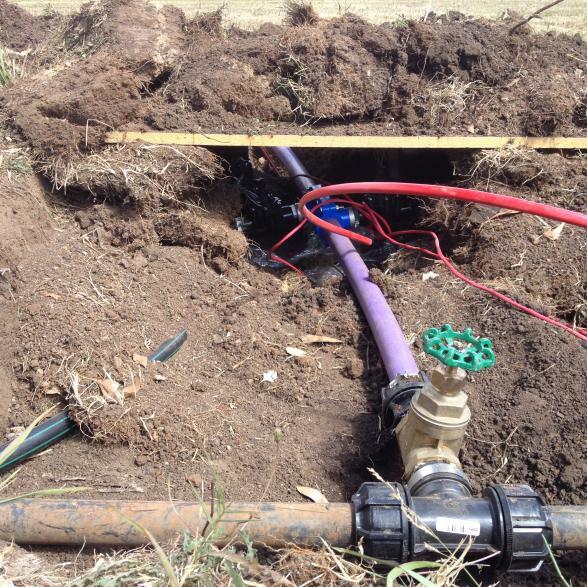 Additional piping run and sprinklers added so that all tees are irrigated, decoders will be added to these valves. 4. 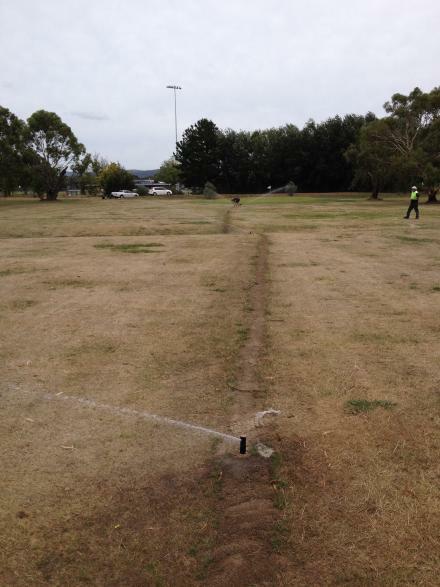 Up to seven additional banks of fairway sprinklers put in place. 5. 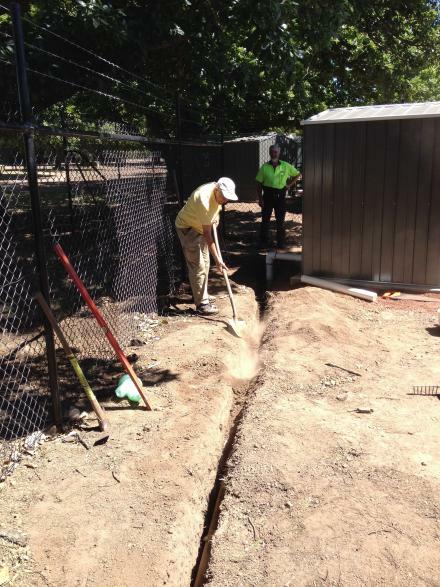 Additional tapping points to irrigate existing and new garden beds around the park. John L, Tony L, Bruce and Ron were on the job. 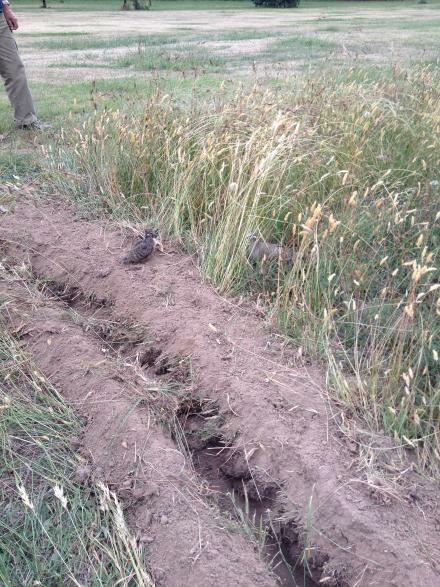 Our fairway and other trenches had seen many visits from rabbits who left numerous scratching of varying depths. 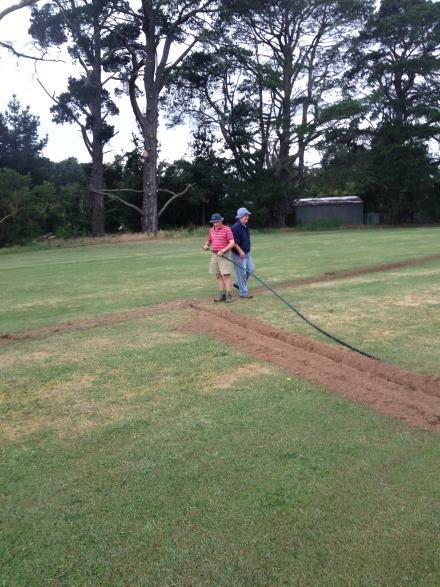 The autumn rains had also seen the loose soil begin to settle so some backfilling had to be done. 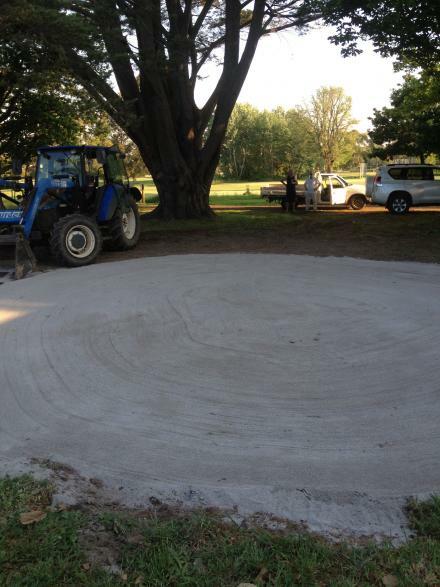 Over to Frontier Garden Supplies for two metres of soil and then out onto the course. Plenty of shovelling, walking to and from and raking was involved. The trenches took a surprising amount of soil and we were soon back for another metre and a half to get the job was finished. It was a beautiful autumn day and whilst repetetive the work was not overly strenuous so all enjoyed the activity. What a crew, Ron on a 106/27 visa – “Specialist Rake Operator” – and two locals looking to learn the trade but happy to start an the bottom and work their way up. Twig and Tony L were on the job. 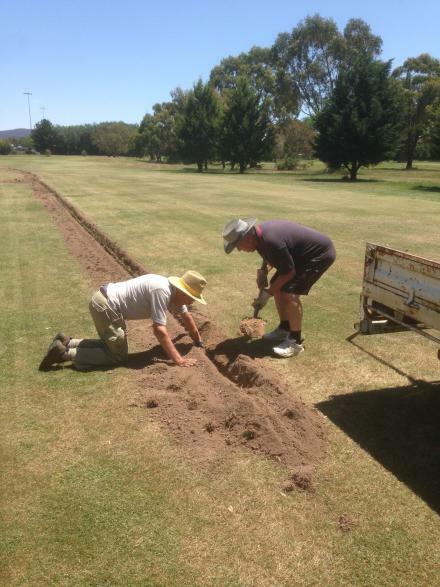 Work on the irrigation of the tees got underway. With the trencher away this work had to be done by hand. Luckily some reasonable rain over the preceeding weeks saw the soil reasonably soft so the work was not too difficult. 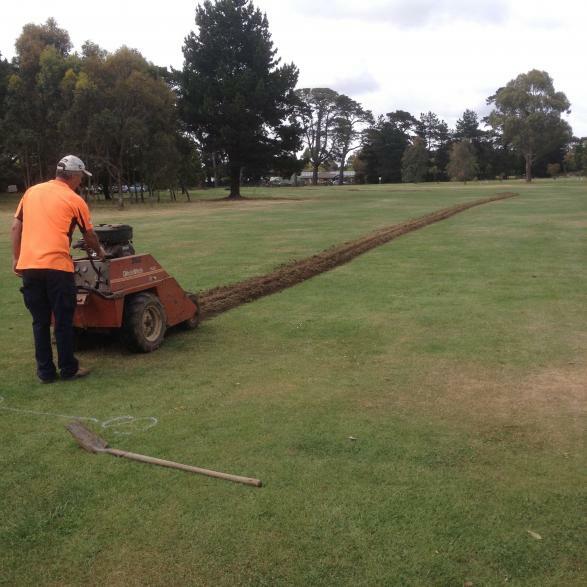 The run of pipe to the tee was also quite short so not too much trenching was required. After sorting out the joiners, reducers, extenders, the sprinklers and the teflon tape we were away. The central electronic controller is put in place, now to disconnect the manual timers and put in place the new valve timers. Earth rod, sealed cable joins, saddle join, valve and decoder, getting a bit crowded inside the valve box now. Now, only five extra banks of fairway sprinklers to go in. Will have to wait until after the Club Championships in September then back on the job. Twig, Ron and Tony L were on the job. 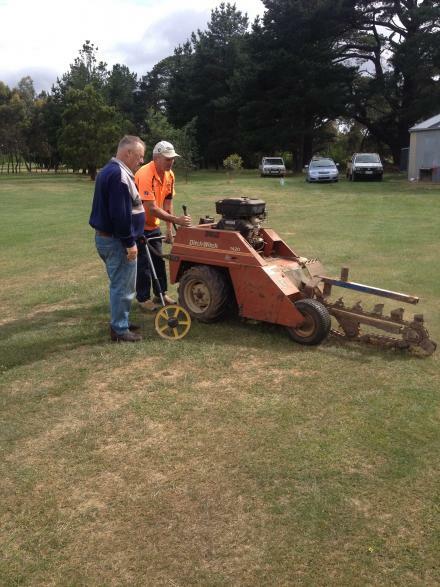 Freebie and Tony L had picked up the trencher the day before so all was ready. Out and on to the 8th, two banks to go in. Brutus purred away happily (JB had done a great job fixing bits here and there), the soil still showed quite a bit of moisture. 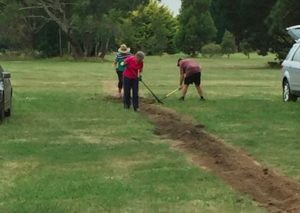 The first trench and connection to the blue-line went in well. As we approached the last third of the 2nd trench a new sound caused us to lift the digging arm to inspect for a jammed stone. Nothing there but the noise was soon identified as the drive belt slowly coming apart. With care we nursed Brutus through the remainder of the trench than ran the trench to the blue-line, all very surprised that the belt actually lasted this long. Sprinklers connected and sanded and valves connected and Brutus back to the shed. A spot of back-filling and then a test, both banks put out a strong and steady flow of water. 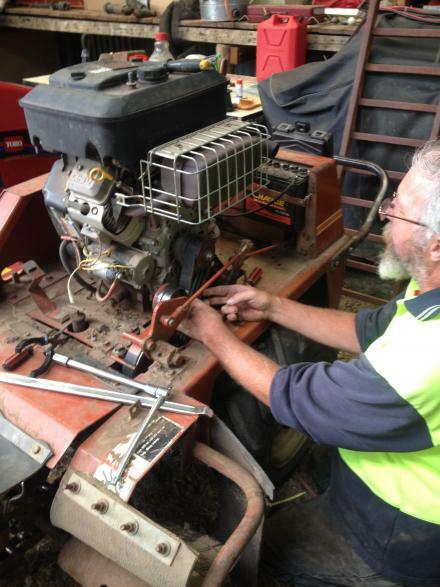 We still had two spare DitchWitch belts in the shed so time for well known belt replacer and RGC captain, Tony Freeman, to put his previous experience into practice. Tony L took guards off, manhanded tools and leant some muscle where and when needed. Took just 20 minutes this time and we are getting better at this. All ready for the next day. Just leave the detailed work to Twig. 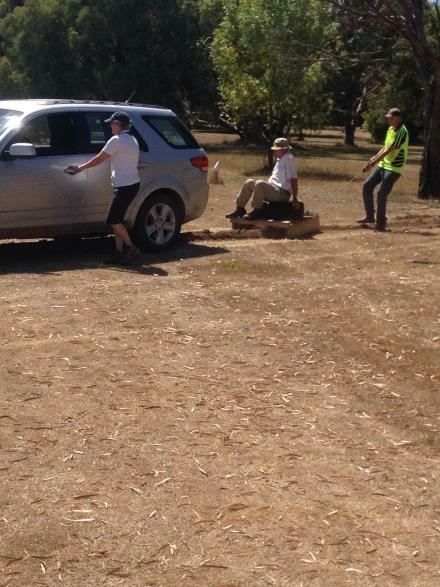 Do you reckon he can get Brutus between the truck and the tree and over here to the junction box? Twig, Ron, Tony L, John L, Tony F and Bruce were on the job. Elaine Scanlon provided a great morning tea. Bruce, Pam Drummond, Lorraine and Beryl worked the rakes in the cool of the evening to finish off the backfilling of the trenches. After years of planning, application writing and presenting to various bodies this all important project was approaching a successful conclusion. The actual on course work has taken just over 12 months now stage one (Fairway and green’s sprinklers) and stage two (tees, electronic valves and central control system) are virtually done. A trench and sprinklers on the western end of the 4th and one on eastern end of the 4th and it was almost over. Fit then level and sand the sprinklers before the “smudger” was back in action. Certainly a lot easier on the back than backfilling with rakes and shovels. 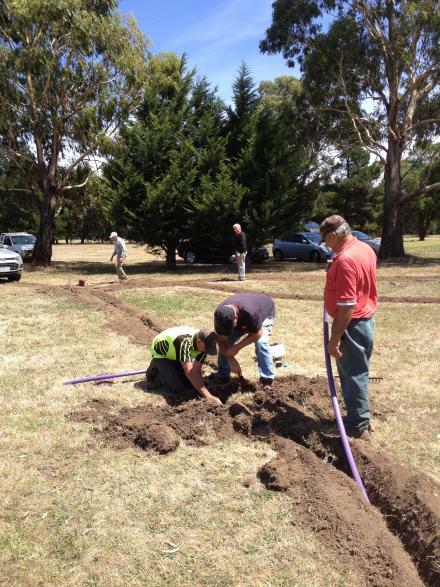 With Ron driving, Bruce acting as chatty ballast, Tony F lending a certain gravitas to the situation and Tony L keeping the smudger on line we did a basic backfill of all trenches. 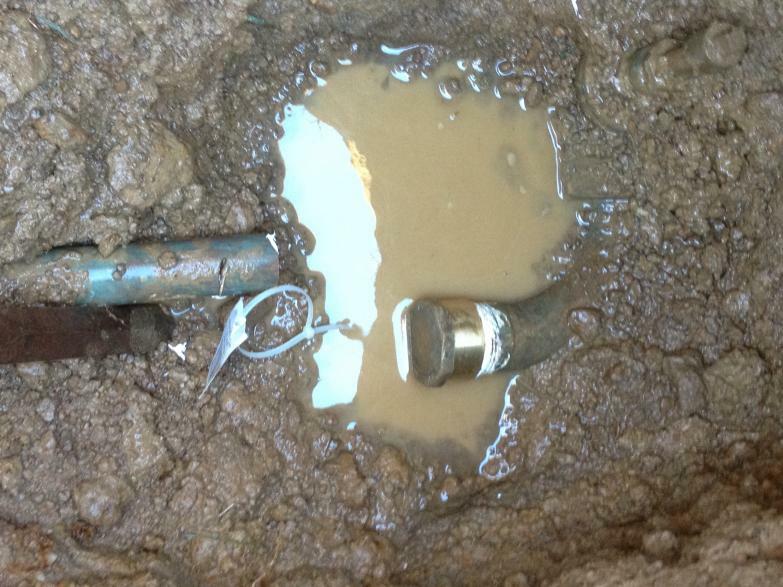 * The old mains water supply disconnected and meter returned to Western Water. 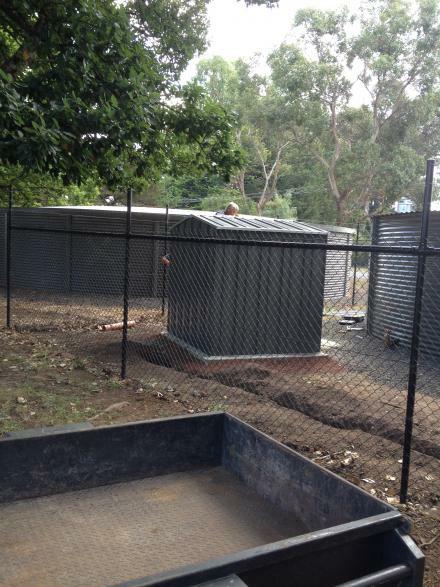 * Tank, fenced enclosure, pump and pump shed installed. * Power connected to the pump shed. 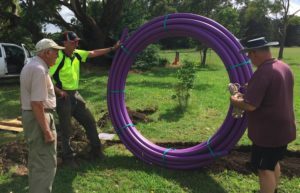 * 90 mm pipe from the pump to the 40 mm ring main/40 mm purple pipe junction. * Central control system in place. * Decoders on every control valve. * All paperwork with Western Water filled out and signed off. * A park/golf course that is much greener and more attractive to community members and native fauna alike. All in all a stunning effort by this group of volunteers. In little over 40 RGC members have had a hand in this project. Now let’s see the system run for 12 months and then decide if and what additions/alterations we have to make. 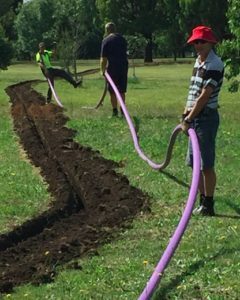 On the 5th where the 40 mm purple pipe runs across the course to connect to the old 40 mm Blueline. 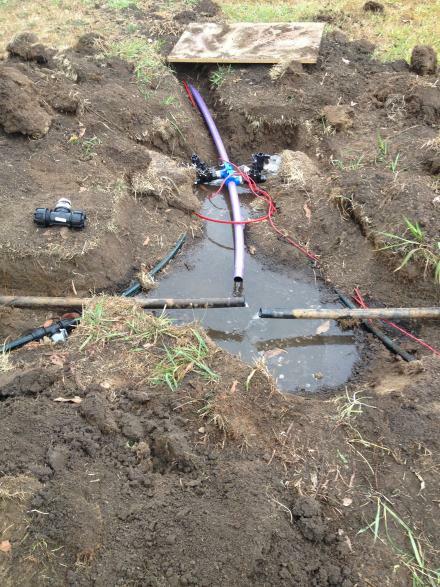 Now, dig very carefully, find the purple 40mm pipe, DO NOT hit the thick red cable! Then we can run the 25mm green-line under them both. 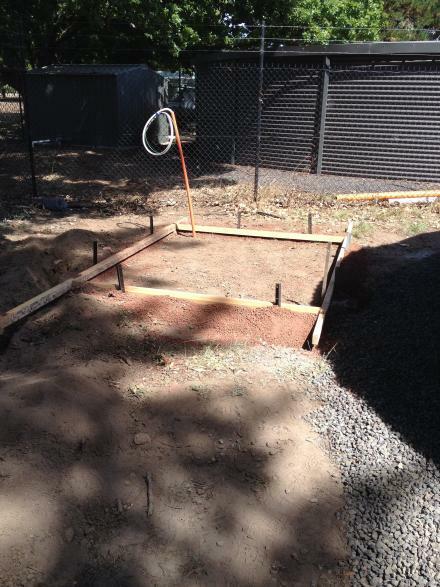 First, locate the sprinkler then level it off and backfill with sand. With Twig already off on the fairway mower and John L off to a meeting this bunch was all that was left to photgraph, Tony Freeman, Ron Walker and Bruce Robb. Well done gents. After almost 12 months of irrigation we now know just how involved this whole process is. We have tried a number of different regimes to irrigate the course and have finally settled on one that works. We have also discovered that the 10,000,000 litres of re-cycled water that was allocated to us is nowhere near what is required to keep the course green for most of the year. Our records show we used all that during the months November to March. We are currently in discussions with Western Water about increasing this annual amount of water and about increasing the inlet pipe from 25mm to at least 40mm. We are also looking into running a second pump to make sure we can get the required amount of water out on ot the park each irrigation night. The second pump will allow us to run more banks of sprinklers at the same time. 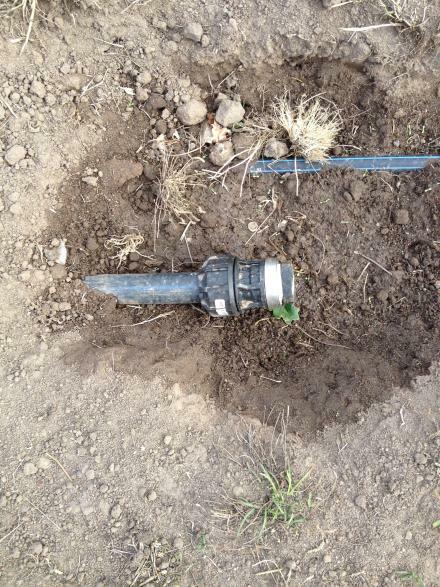 We will also change the current sprinkler nozzles to allow for a larger spray of water. 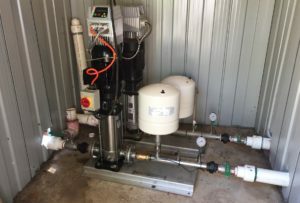 If we are successful in getting an increase in our annual re-cycled water allocation, in increasing the size of the inlet pipe and if we get the pump and larger nozzles in place we will then have to make sure that we can get the required amount of water in to the tank each night. This is especially the case during the hotter months of Nov – March, when everyone else is looking for re-cycled water as well. Not as simple as some might think. 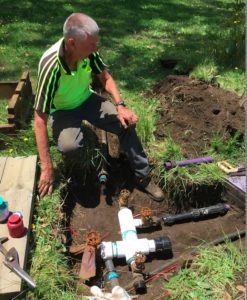 In late 2016 we were successful in increasing our annual allocation of re-cycled water from 10 Megalitres to 14 megalitres, 10 Mg high season and 4 mg low season. 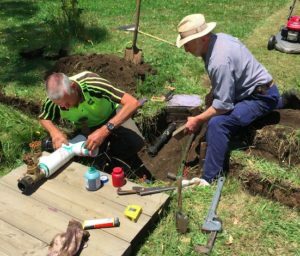 In September of 2017 Western Water informed us that the connection and water meter would be increased from 26mm to 32 mm, so more water more quickly. The inlet was increased to 32mm in late 2017. This gave us a flow rate of about 8 litres per second. WW contacted the club re taking additional water. After discussions it was decided that we should prepare a document to outline the current situation and specify what would need to be done to allow us to take additional water and deliver to the course. WW has was given document and they are considering it. We do not expect to hear back from them until the middle of 2018. Well, nothing what so ever from WW so off we went again. We had a stroke of luck in early 2018 when the MRSC contacted us to say that they did not have any more use for the bore within Romsey Park. They inquired as to whether we, RGC, might be interested in taking over the license and the annual lease. We gave a very considered “Yes” and then completed the necessary paperwork and required payment. The bore and ~10Mg of water pa was ours. The big problem was we did not have enough pump power to get enough water out on to the Park in the time allotted to us for irrigation. Between May and August 2018 we were busy applying for funds to expand the irrigation system. 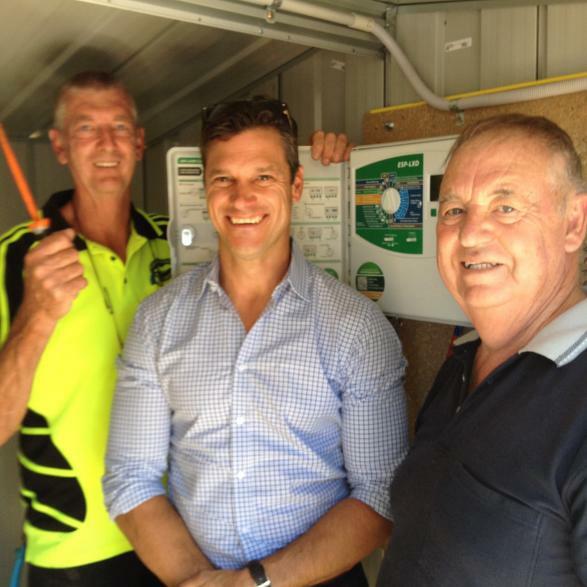 First off was the Bendigo Bank’s Community Investment Program. 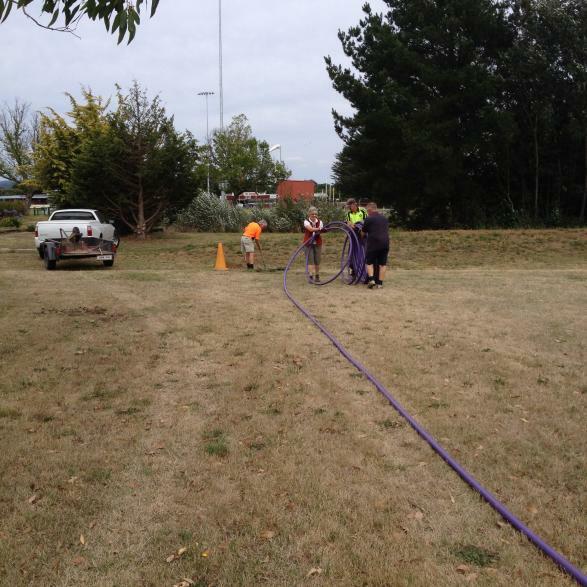 We applied for funds to purchase and instal a second pump so as to provide the power to get the water out on the Park. 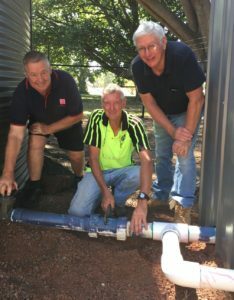 Second was to local MHR Rob Mitchel for funds to expand the irrigation infrastructure so it could handle the increased output of the 2nd pump. Both grants, to varying degrees, were successful. With money from the club we would be just about able to hire the trencher, buy all the 25mm, 40mm, & 63mm pipe, necessary fittings and glues etc and get everything either in the ground or in the pump shed. 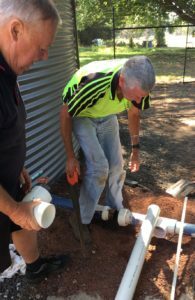 Ron (Planner and organiser extraordinaire) and Twig (Gifted artisan) were quickly on the job, working out how and exactly where to instal the 2nd pump and consulting with Mick Breen at Sunbury Water Pros as to exactly where additional piping, sprinklers, decoders etc had to be placed. Ron and Twig were on the job. With heavy rain at the end of the week, more predicted over the weekend and cool, slightly wet conditions predicted for the following week this was the perfect time to get on with the job. The glue would take 48 hours to harden and cure so conditions were perfect to turn off irrigation system for a few days. 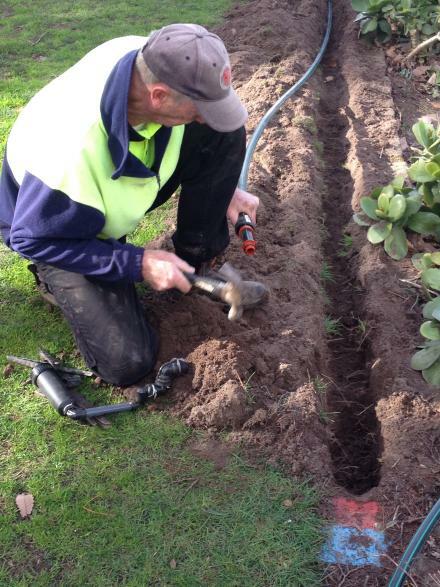 The main distribution box was dug out and a new manifold fitting was designed and measured up. 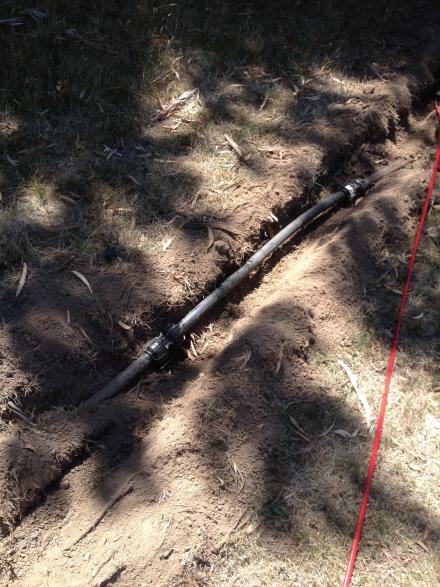 The route for the 63mm pipe was walked and all exisiting piping located and uncovered. Cutting a pipe would be OK but cutting the heavy red cable cable was a definite NO! These initial works would be vital for the successful laying and connection of the 63mm pipe. Ron, Tony L and Twig were on the job. The water was turned off and the new manifold fitting was checked for size. 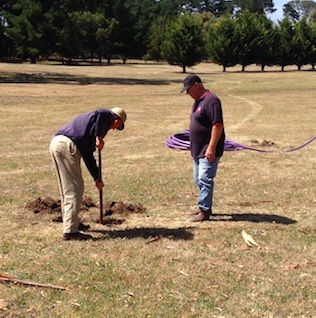 The route for the 63mm pipe was mown and a few “Jumping Jacks” ants’ nests along the way were dealt with. The manifold was cut to size and glued in place. All was good for the trenching. One of the exisiting pipe and cable points we had to go under. John F, Bruce, Lorraine, Tony L, Twig, Ron & Scotty were on the job. The 63mm line was trenched, tricky here and there where we ran up against existing pipe or the dreaded RED CABLE but we made it. Next introducing a loop to improve water flow and pressure to the 15th. 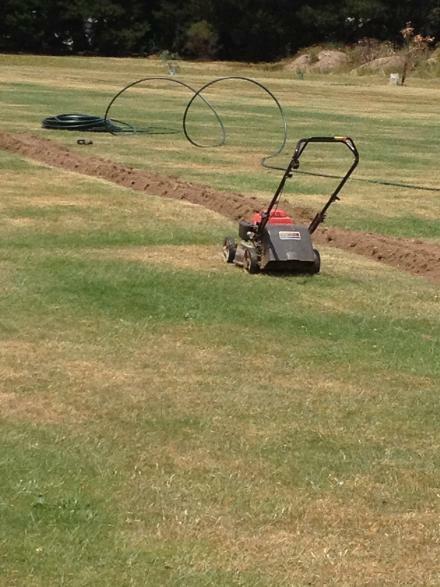 The route was walked and exisiting piping and cable uncovered then closely mown. 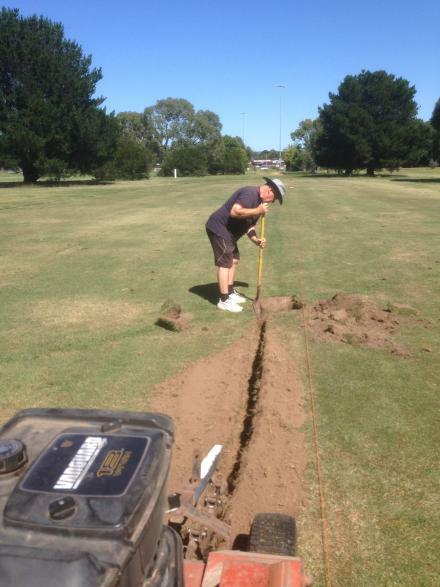 We had to find the blue-line ring main at the back of the 16th. After a few exploratory holes nothing was to be found so we left it to Brutus to do this job. After about 5m we hit pipe, marked it and then dropped the depth. A further 5m along we hit the blue-line ring! So there you go. Trenching the remainder was pretty straight forward apart from negotiating the red cable and the ring main but all was good. 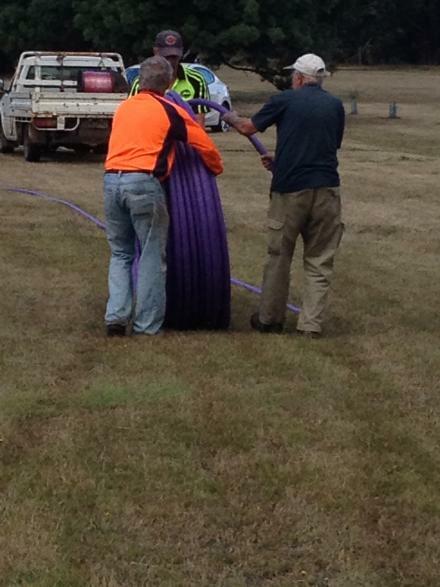 The purple 40mm pipe was rolled out, (thanks Twig & Ron) and we were about 40m short. 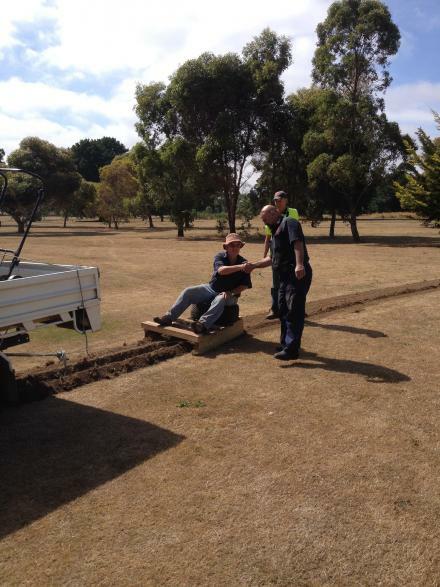 A spot for the connection and decoder to irrigate the practise green was dug out and the route to the green walked, mown and trenched. 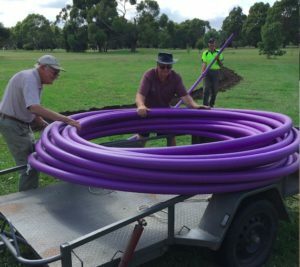 Ron was off to Sunbury Water Pros to pick up the two rolls of purple 63mm and one of purple 40mm pipe ready for the next day’s work. A big day with much accomplished. Meanwhile Hugh chugged around the greens putting out X spray with a spot of Y and Q mixed in, greens still looking excellent. John L was also about mowing tees and surrounds. Place looks good John. Again, a graceful curve is a thing of beauty. 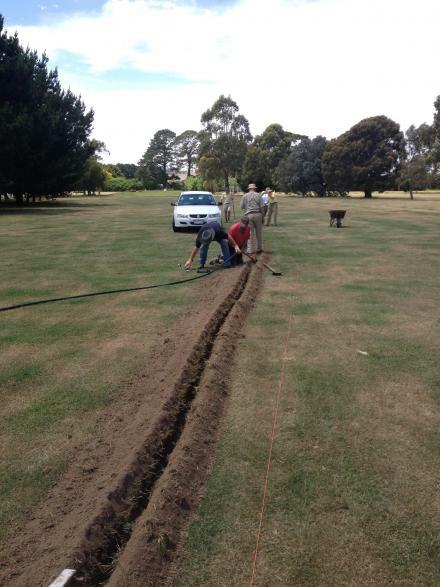 Trenching from to the ring main behind the 16th back the 15th. Bruce, Twig, Ron, Tony L, John F, Scotty, Lorraine and Wendy were on the job. Twig was on the spot early making sure a few of the simpler fittings were in place and watertight. 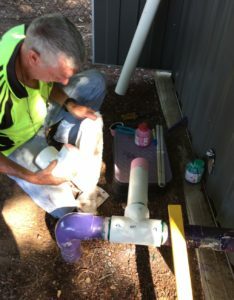 The extra 40m of 40mm purple went into the 15th quite easily and all connections were soon in place and watertight. Again Twig did the tricky stuff, Tony, Bruce & Ron just supplied the muscle to drag things around and hold them in place. Ron had the rolls of 63mm pipe ready to go. The 63mm was both heavy and cumbersome, two of these big rolls would require a real of effort. We discussed various ways of unrolling it beside the trench then Twig had a brilliant idea. We lifted the roll on to Ron’s trailer and with Tony, Ron & Bruce rotating the roll Twig, Scotty and John F were able to drag the pipe out. Being a cool morning the pipe was not at all happy to bend but with a bit of man-handling we were able to connect it to the manifold. The 2nd roll went pretty smoothly fitting under some fairest piping and connecting into the 40mm purple at two points. 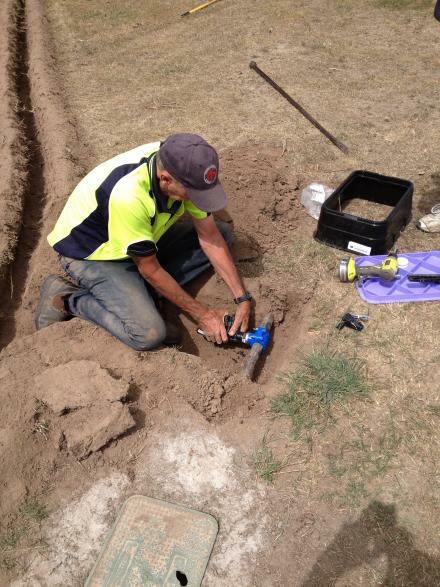 Twig also fitted a dead and valve for the practise green irrigation. 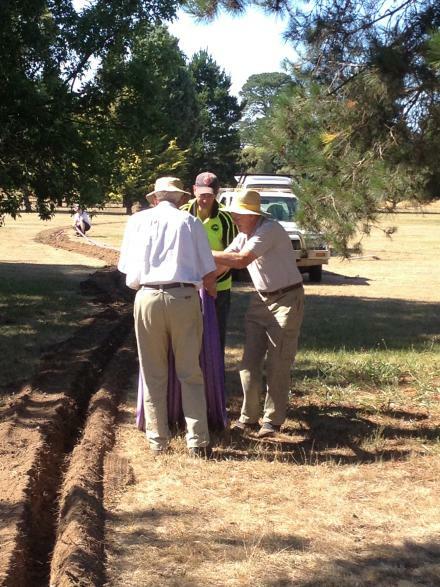 Tony, Bruce and Scotty then applied the John Laing Esq patented trench filling-in technology. This little invention did a great job dragging about 80% of the loose soil back into the trench. 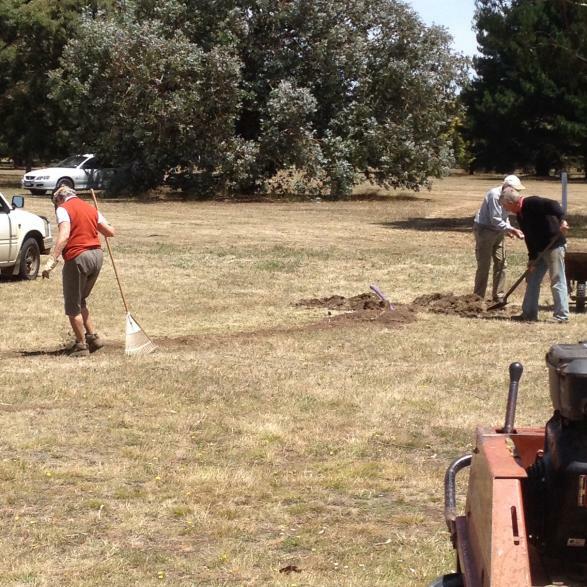 Ron, Bruce, Lorraine, Scotty and Wendy did a sterling job raking any remaining soil on to the trench line. So, now to test all our work, took some time for the system to pressurise and when it did we found two small leaks. Will see how they go, they may take up. 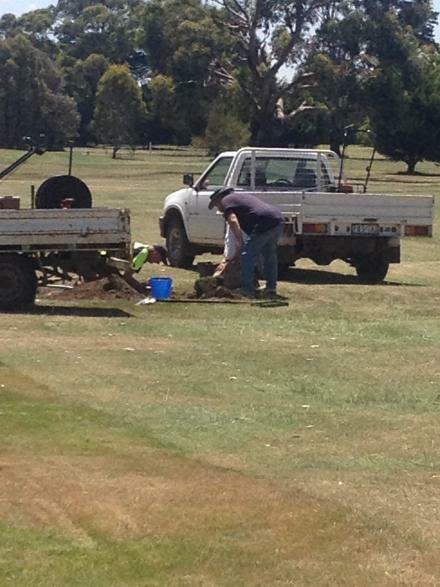 The damaged blueline ring main behind the 16th is repaired. Well, she sure is big, how are we going to handle this? You two turn and I’ll drag. Freebie and Scotty came along to help out, by this time Twig was having trouble taking things seriously. 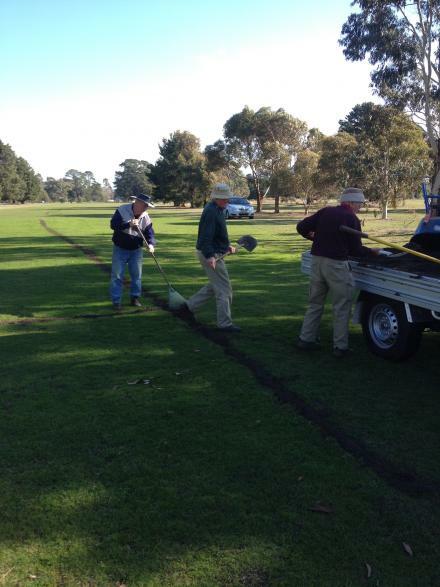 The John Laing patented Trench Filling Technology in use, Bruce clearing and Scotty providing navigation. Ron, Wendy & Lorraine finish off filling the trench. Scotty and Tony were on the job. Simple enough work, roll out the 25mm pipe. Connect to the decoder and valve, cut in a T-join and three connections for sprinklers, connect the sprinklers then back-fill and test. A spot of raking and back-filling the trench and all was ready for a test. Piping connected to the decoder and valve box. Day 47 – Monday January 21st 2019. Twig, Tony, Ron & Hugh were on the job. A few days earlier Ron had picked up the 2nd pump and he, Tony and Twig had man-handled it into the pump-shed. Connecting the 2nd ump to the system took a great deal of thought and planning (Ta Twig). We had to put a T-piece into the inlet pipe and then cur precisely so that the new piping was level and lined up with the new pump. The tricky part, at the inflow and outflow ends was connecting to the elbow while also connecting to the barrel union on the pump. Measurements were taken twice before any pipe as cut. Primer and glue were applied and each join was tackled one by one. With quick-drying glue it was very tricky and the odd last minute change had to be made to allow pipe to be lifted up, slid into the elbows and then quickly pulled back a few mm and tightened to the pump at the barrel union join. There was a spot of tin cutting to allow for the elevation. Under great duress everyone held their cool and the job was done. Allow 24 hrs for the glue to harden and cure and we will be able to have a test run by about 4.00pm Tues 22nd. 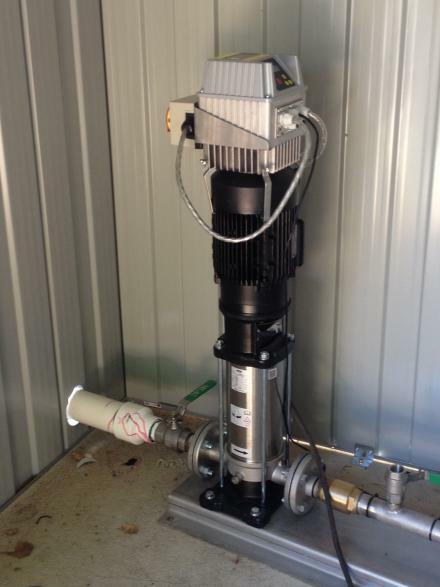 Our 2nd pump, finally in the shed, just waiting to be connected to the system and bolted to the concrete. Cutting in on the outflow side. Ron, Twig & Hugh. Everything connected, 24hrs for the glue to dry and cure and we will give her a go. And there you go, two pumps, side by side, just waiting to get on with the job.